© FICMS All rights reserved. FI Content Management System (FICMS®) is a very powerful, privately owned closed-source content management system (CMS) developed over the years to fully support the direct needs of the modern website design & development industry. You couldn’t ask for a simpler way to add and manage website content. FICMS’s publishing features are broad, comprehensive, and highly flexible. The purpose of this document is to help guide you toward understanding how to use FICMS and all of its features to efficiently manage & maintain your website. The following options are present in the administrative panel across all of FICMS’s sections/modules. Take a moment to familiarize yourself with what each one of them does. Search - The option to search within a section/module is present across all tabs in the admin panel under its particular section. It's easily accessible below the menu on the top right hand side of each section/module. The Add New button is located in the top right corner of all applicable sections/modules in the admin panel. The button allows the admin to add new entries into the system for that particular section/module. Common options like Activate, Deactivate, Delete, Reorder, Reset Hits, and Refresh are available in the bottom left corner, just below the list of entries in a particular section/module. When you select an entry (by checking the box next to the list of any entry) and press the appropriate option (the operation you want to perform), it will update the entry. The Activate button will activate an entry so that it can be seen on the front end of the website. The Deactivate button will deactivate an entry so that it can not be seen or used on the front end of the website. The Reorder button is used to change the position of an entry. Just enter a numerical value in the check box to the left of each row and push Reorder. The Hits column shows the hit counts for each entry, and the Reset Hits button resets the Hits column back to 0 when reset. The Refresh button will update the list and show new counts for each applicable section/module. Individual Edit and Delete options are available for each entry, and are located in the right corner of each row. You couldn’t ask for a simpler way to add and manage content. FICMS’s publishing features are broad, comprehensive, and highly flexible.Adding and editing content in FICMS is easy and flexible. 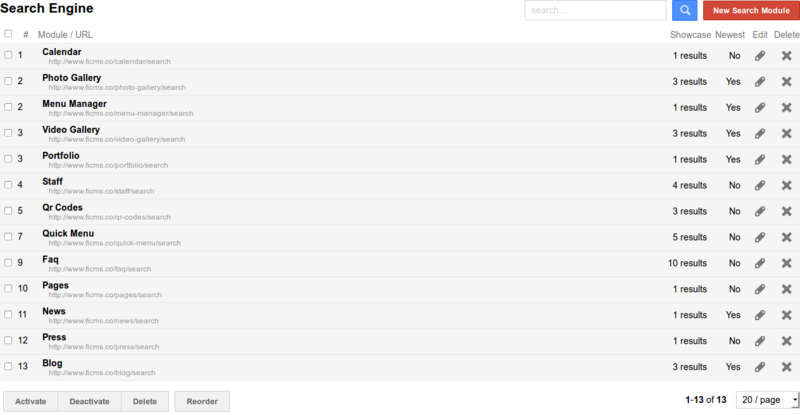 After logging into the FICMS admin panel, under the content section/module, click Pages. This section/module includes all the pages that appear on the front-end as well as pages that are in draft mode. To Add a New Page click on the red New Page button in the upper right corner of the admin. To Edit a page click on the Edit Icon within the Edit column on the right side of the admin. To Delete a page click on the Edit Icon within the Delete column on the right side of the admin. Clicking on an item will expand to show details about the page and the formatted content it contains. The expanded view also provides a blue Preview button that opens the page in a new window, as well as a blue Edit button that opens the record for editing. The Title field is the headline that will display at the top of the page above the content. It will also be used within navigational breadcrumbs. The Sub Page Of drop down selector provides a list of pages already created in the system. Should you want to assign the page you are working on as a sub page of another (to appear as within a section), simply select the page so place it under from the drop down. For example if you are working on the Our Team page and want it to appear under About Us, you would simply select About Us from the drop down. The Featured Image upload function is used if your template or theme contains a banner image that can be edited per page. This can also be applied to any other image you have worked into your design that you want to control on a per page basis. The URL line is the slug or path for that page. You can edit the slug by clicking on the trailing black text following the root domain. By default the system uses the title and replaces spaces with hyphens and changes everything to lower case. You can preview the page by clicking on the blue Open button to the left of the URL. The WYSIWYG editor provides you will complete control to enter and format your content. You can work with the editor or toggle to reveal the page HTML by clicking the SOURCE button in the second row of icons on the far right. If you have an existing page that you want to duplicate and modify to retain formatting or reduce work, click the gray Save As New button at the bottom of the record then open and edit as needed. The Short Description is used to edit the Page Short Description that appears when sub pages are listed on main pages. The editor has two options, the WYSIWIG editor and the Source code editor. Just push the Source button to toggle between the editors. The Page's Layout drop down selector allows you to assign preexisting layouts to a page. The Redirect URL field allows you to enter any URL you want the page to be redirected to. The Sharpen Featured Image Thumbnail will sharpen a thumbnail image of the featured image if the box is checked. The Accessibility options allow you to assign if a page is accessible and/or viewable by the public users or by specific logged in users based on the group they are assigned to. The Active box must be checked for the page to be displayed on the site. The Featured box must be checked if the page title and short description are to be displayed on the homepage (should your design support that). The List Sub Pages box must be checked if you want a list of pages the pages that have been assigned under the one you are editing to appear at the bottom of the page. This will show the titles and short descriptions of the sub pages. You can choose to not enter content on the page and only display the sub list should you decide. The Disable Direct Access box must be checked it you want to restrict direct access to a page. The Priority text box allows you to set the order the pages display in. The SEO Options section allows the admin to add or edit the Meta Title, Meta Keywords, Meta Description, and Canonical URL of the page. Creating and sharing fresh content should be easy. 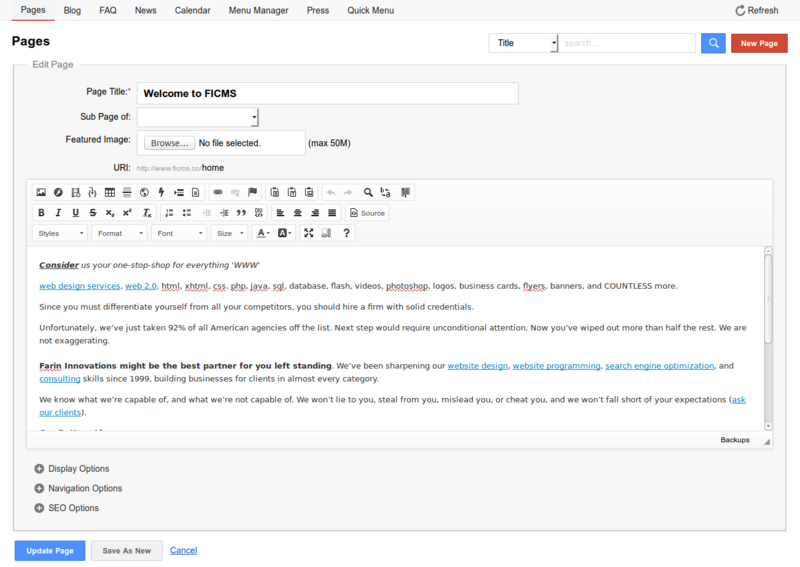 FICMS does away with confusing dashboards and multiple screens, allowing you to publish blog posts effortlessly from either the front-end and the admin panel. 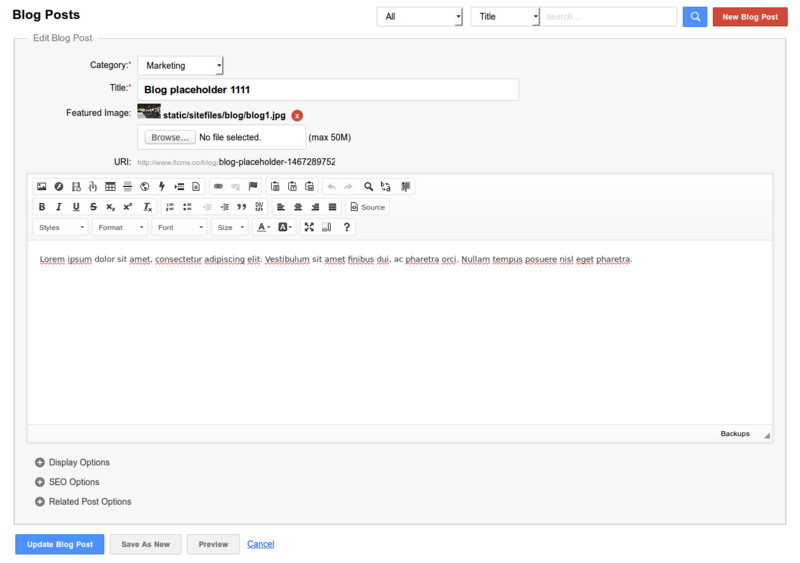 Creating a new blog post in FICMS is easy. Just login to the FICMS admin panel and click Blog under the content section/module. 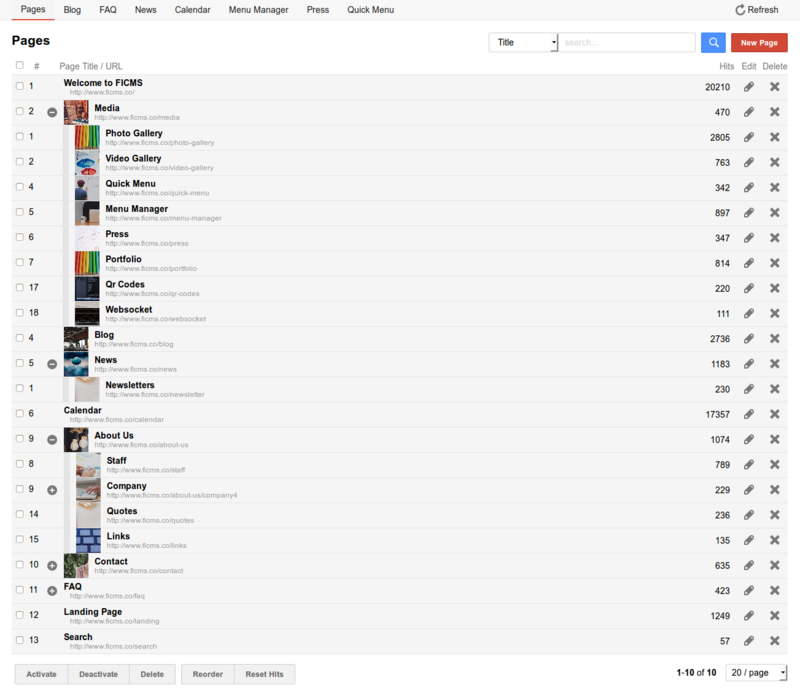 It will display the list of blogs created. Clicking on the blog name displays details, including the ability to upload an Image, assign a Category, and define the Title, URL, Status, etc. The Preview button is available by clicking on any individual row in the given section/module. It will be a blue button in the right corner and allow you to preview how the blog will look on the front-end before publishing it. The New Blog button in the right column allows the admin to create a new blog post to display on the front-end. The Edit button in the right corner allows the admin to edit the blog information, including the Category, Title, Featured Image, URL, Description etc. 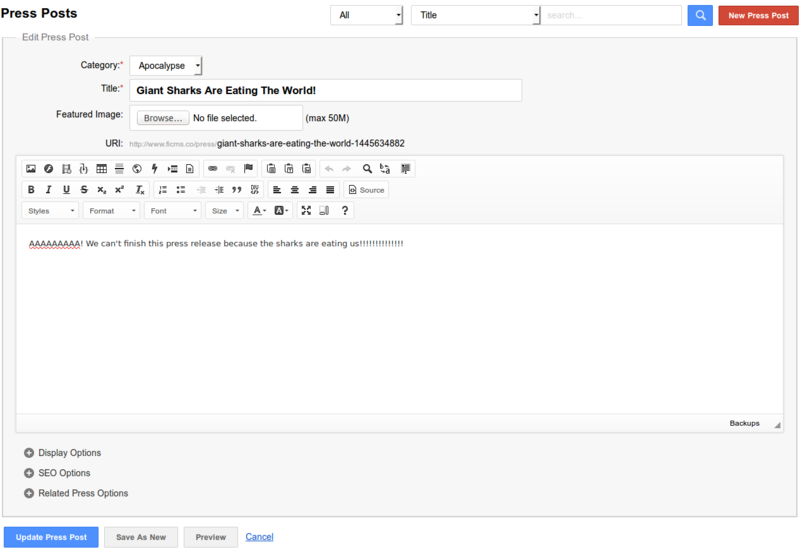 This section allows the admin to edit the blog post 'short' description. The admin has two options, the WYSIWIG editor and the Source code editor. Just push the Source button to toggle between the editors. If content is entered into the 'short' description editor, it will be displayed below the headline along with a Read More button on the main Blog section page that lists the available articles. If nothing is entered in this editor, then the full content of the article will display on the main Blog section page that lists the available articles. Articles by default are displayed in chronological order based on the "Post On" date field. This feature allows the editor to set a future date and time when the post should go live on the front-end of the website. The "priority" box can be used to set the Page priority or sort order in the listing. Enter a numerical value in ascending order and push "Update News" to change the order that the pages appear on the front-end. This will override the chronological listing of articles. 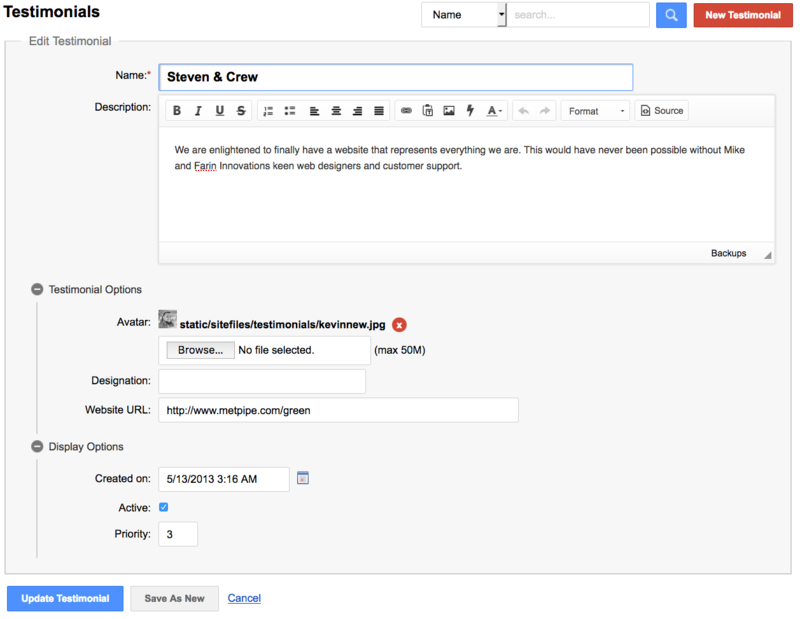 The Tags area allows the admin to add tags as words separated by commas. These words can then be searched by users on the front-end of the website when looking for content. The Source URL is used to define where the original source file/content was located. Entering a URL into this box will allow people to navigate to this URL from the front-end. The Active checkbox will activate an entry so that it is visible on the front end of the website. If you uncheck this box, the entry can not be seen or used on the front end of the website. The SEO Options section allows the admin to add or edit the Meta Title, Meta Keywords, Meta Description, and Canonical URL of the blog post. This option allows the admin to define related posts to appear at the bottom of each particular blog page. If you want to show your visitors other posts that are related or similar to the one you are publishing, this is the place to do just that. Clicking on a category name will display options like Title, URL, Status, etc. that can be modified. The New Blog Category button in the right corner allows the admin to create a new blog category. The Title field is used to control the Title of the Blog Category. This section allows the option to set a category to "Active" or "Inactive". Just check the "Active" box to display the category on the front-end, or uncheck it so that it is not visible on the front-end. The "priority" box can be used to set the Category priority. Enter a numerical value in ascending order and push "Update Blog Category" to change the order that the blog categories appear on the front-end. 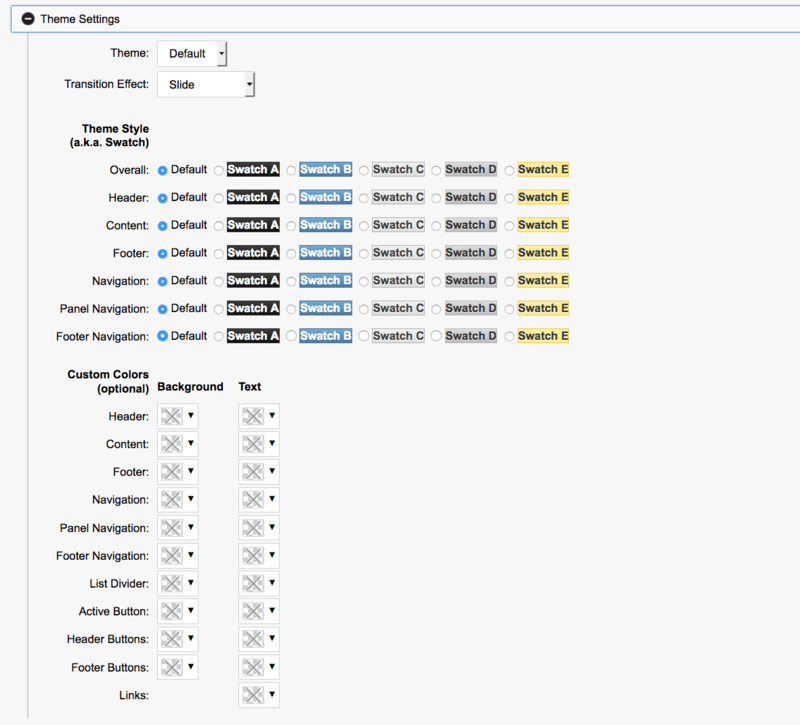 This settings tab includes all the common settings of the particular module/section. For example, the admin can set the number of items to display per page, the number of columns and rows, and even the currency symbol & position to use. How to make FAQs simple: asked and answered. FICMS gives you a flexible, manageable way to educate site visitors – without losing your own mind in the process. Update your FAQs via either the front-end editor or admin panel, with a system that organizes content logically and keeps it in one accessible place. Frequently Asked Questions (FAQ) are an important aspect of every website, and FICMS has a section/module made specifically to manage FAQs. Just login to FICMS as an admin and click on FAQ from the content menu. It will display the list of FAQ categories. Clicking on the category name will displays details such as the Title, URL, & Status that can all be edited. It will also show the Preview button to the right that allows you to preview how the FAQ category will look on the front-end before publishing it. The New FAQ Category button in the right corner allows the admin to create a new FAQ category. The Edit button in the right corner allows the admin to edit category information, such as the Title, URI, etc. This section allows the admin to edit the FAQ content description. The admin has two options, the WYSIWIG editor and the Source code editor. Just push the Source button to toggle between the editors. From this section, the admin can also set the status of a category to Active as well as set the priority (sort order) for each record. The "priority" box can be used to set the Category priority. Enter a numerical value in ascending order and push the Update button to change the order that the FAQ entries appear on the front-end. Clicking this tab displays a list of all the "FAQ" questions/posts. The New FAQ button in the right corner allows the admin to create a new FAQ entry. The Edit button in the right column allows the admin to edit existing FAQ entry information, such as the Category, Question, Answer, etc. The Edit button in the right column allows the admin to edit the FAQ information, such as the Category, the Question, the Answer, etc. Just select a category, type your question and the corresponding answer and hit Update. News sharing capability at the touch of a button. FICMS allows you to integrate a sophisticated, sleek news module, that is easily editable from the front-end or admin panel. 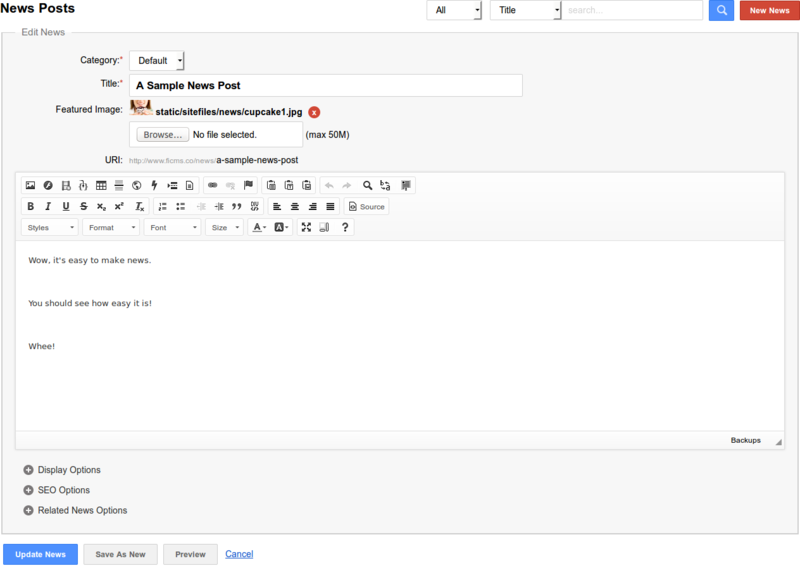 Creating a News Post in FICMS is easy. Just login to the FICMS admin panel and click News under the content section/module and it will display the list of all news posts created. Clicking on the name of the news post will display it's details, such as the Featured Image being used, the Category, Title, URI, Status, etc. The Preview button is available by clicking on any individual row in the given section/module. It will be a blue button in the right corner and allow you to preview how the news post will look on the front-end before publishing it. The New News button in the right corner allows the admin to create a new news post to display on the front-end of the website. The Edit button in the right column allows the admin to edit information like the Category, Title, Featured Image, URI, Description etc. This section allows the admin to edit the news post 'short' description. The admin has two options, the WYSIWIG editor and the Source code editor. Just push the Source button to toggle between the editors. If content is entered into the 'short' description editor, it will be displayed below the headline along with a Read More button on the main News section page that lists the available articles. If nothing is entered in this editor, then the full content of the article will display on the main News section page that lists the available articles. Articles by default are displayed in chronological order based on the "Post On" date field. The PDF Attachment option allows you to include an associated document and the system will automatically generate a Download PDF button linking to it. The Post On fields allows the editor to set a future date and time when the post should go live on the front-end of the website. The SEO Options section allows the admin to add or edit the Meta Title, Meta Keywords, Meta Description, and Canonical URL of the news post. This option allows the admin to define related news posts to appear at the bottom of each particular news page. If you want to show your visitors other posts that are related or similar to the one you are publishing, this is the place to do just that. Clicking on the category name displays details such as the Title, URI, Status, etc. The Preview button is available by clicking on any individual row in the given section/module. It will be a blue button in the right corner and allow you to preview how the news category will look on the front-end before publishing it. The New News Category button in the right corner allows the admin to create a news post to display on the front-end of the website. The Edit button in the right corner allows the admin to edit the news post's information, such as the Category, Title, Featured Image, URL, Description, etc. This settings tab includes all the common settings of the particular module/section. For example, the admin can set the number of news posts per page, the featured image size, as well as social media settings like enabling Facebook, Twitter, and Google+ buttons, etc. Manage your time more efficiently. FICMS’ dynamic Calendar module offers the intuitive design and simple organization you need to create and schedule events easily. Creating an event in FICMS is easy. Just login to the FICMS admin panel and click Calendar under the content section/module. It will display the list of events created. Clicking on the event name will display details such as the Category, Title, From/To date fields, Status, etc. The Preview button is available by clicking on any individual row in the given section/module. It will be a blue button in the right corner and allow you to preview how the calendar event will look on the front-end before publishing it. The New Calendar Event button in the right corner allows the admin to create a new calendar event to display on the front-end of the website within the calendar. The Edit button in the right column allows the admin to edit the calendar event information like Category, Title, From & To dates, etc. The From & To fields will allow you to schedule a calendar event to publish on a certain date, and un-publish automatically on its end date. Using this option, the admin can set up a recurring event, determining how frequently the event will be repeated -- for example, daily, monthly, weekly, yearly -- and also the time for each event. The admin can set the event to repeat continuously, or specify the number of events to repeat for. This section allows admin to edit the description of the calendar event. The admin has two options, the WYSIWIG editor and the Source code editor. Just push the Source button to toggle between the editors. From this section, the admin can also set the status of a category to Active as well as set the priority for each record. The Active checkbox will activate an entry so that it can be seen on the front end of the website. If you uncheck this box, the entry can not be seen or used on the front end of the website. The "priority" box can be used to set the Page priority. Enter a numerical value in ascending order and push "Update Calendar Event" to change the order that the events appear on the front-end. In this section the admin can also enter a URL that is relevant to the event that upon clicked will open an external URL in a new tab. If no URL has been set for this section, the event info will pop up for the user. Clicking on the category name will display details like Title, Color, URL, Status, etc. The New Calendar Category button in the right corner allows the admin to create a new calendar category. The Edit button in the right corner allows the admin to edit the category information like Title, Color, URL, etc. This section allows admin to edit the description of the calendar category. The admin has two options, the WYSIWIG editor and the Source code editor. Just push the Source button to toggle between the editors. The "priority" box can be used to set the calendar category priority. Enter a numerical value in ascending order and push "Update Calendar Category" to change the order that the categories appear on the front-end. The SEO Options section allows the admin to add or edit the Meta Title, Meta Keywords, Meta Description, and Canonical URL of the calendar categories and events. This settings tab includes all the common settings of the particular module/section. For example, the admin can set the default view, Week and Day Starting and Ending times, and social media settings like enabling Facebook, Twitter, and Google+ buttons. What’s on the menu? Efficiency and elegance. Created especially for industries with a “menu list” of available products and services, FICMS’ Menu module allows you to organize and showcase your offerings with ease. 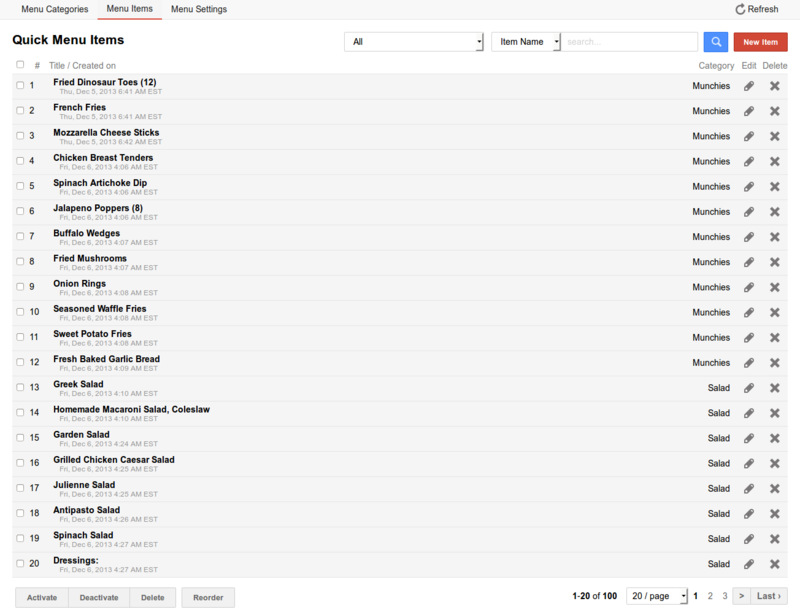 Creating and editing your own Menu in FICMS is extremely easy. 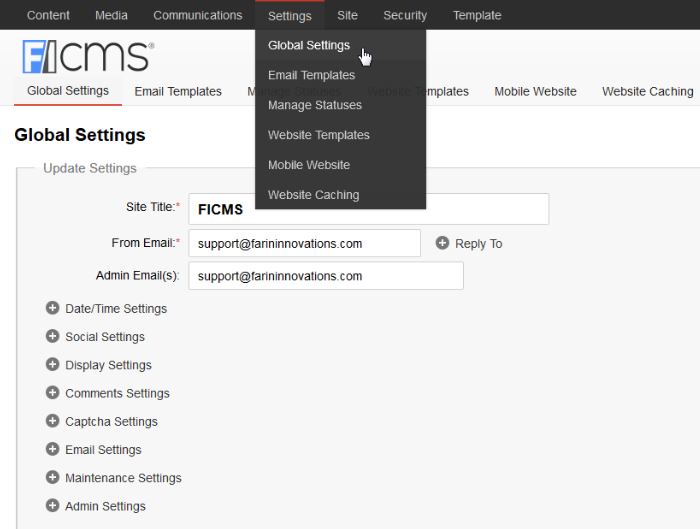 Just login to FICMS as an admin and click Menu from the content section/module from the list of menu categories. Clicking on the category name will display details like Featured Image, Title, URI, Status, etc. The Preview button is available by clicking on any individual row in the given section/module. It will be a blue button in the right corner and allow you to preview how the menu category will look on the front-end before publishing it. The New Category button in the right corner allows the admin to create a new category. The Edit button on the right corner allows the admin to edit category information like the Title, URL, etc. and also upload a category photo to be displayed on the front-end. This section allows the admin to edit the description. The admin has two options, the WYSIWIG editor and the Source code editor. Just push the Source button to toggle between the editors. The "priority" box can be used to set the Page priority. Enter a numerical value in ascending order and push "Update Category" to change the order that the menu categories appear on the front-end. The SEO Options section allows the admin to add or edit the Meta Title, Meta Keywords, Meta Description, and Canonical URL of the menu categories and items. Clicking this tab will display a list of all of the menu items. You can click on the menu item to display details like Category, Item Name, URL, Price, Status, etc. The New Item button in the right corner allows the admin to create a new menu item. The Edit button on the right corner allows the admin to edit existing menu item information like Category, Item Name, URL, Description etc. This section allows the admin to add/edit or update the price for each menu item. The admin can also upload menu item image(s) by clicking the Browse button, finding an image on your computer, and uploading it to the website. 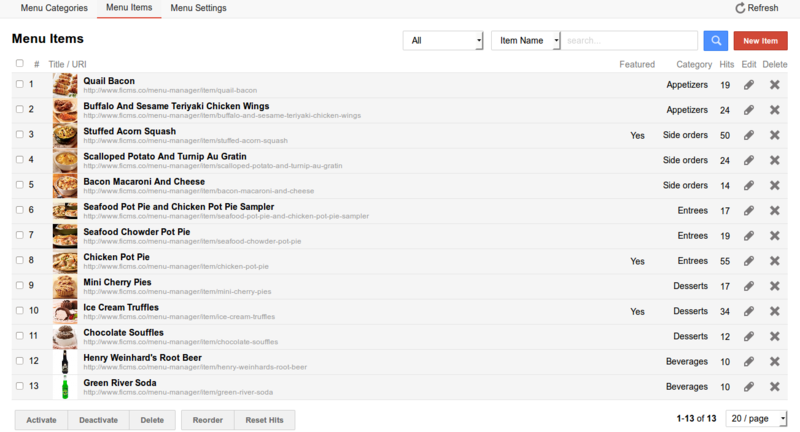 This section allows the admin to edit the description of each menu item. The admin has two options, the WYSIWIG editor and the Source code editor. Just push the Source button to toggle between the editors. The "priority" box can be used to set the Page priority. Enter a numerical value in ascending order and push "Update Item" to change the order that the menu items appear on the front-end. The SEO Options section allows the admin to add or edit the Meta Title, Meta Keywords, Meta Description, and Canonical URL of each menu item. This settings tab includes all the common settings of the particular module/section. For example, the admin can set the number of items per page, the currency symbol, currency position, thumbnail image size, category image size, and social media settings like enabling Facebook, Twitter, and Google+ buttons for the Menu Manager. Keep your audience updated without losing track of your priorities. 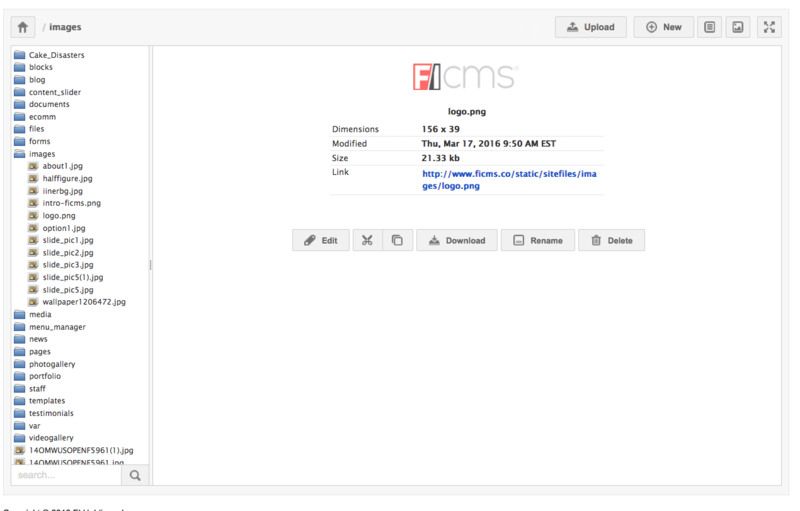 FICMS’ Press module gives you a quick and easy way to share press releases and news articles about your company. Creating a Press Release in FICMS is easy. Just login to the FICMS admin panel and click Press under the content section/module. It will display the list of press releases created. 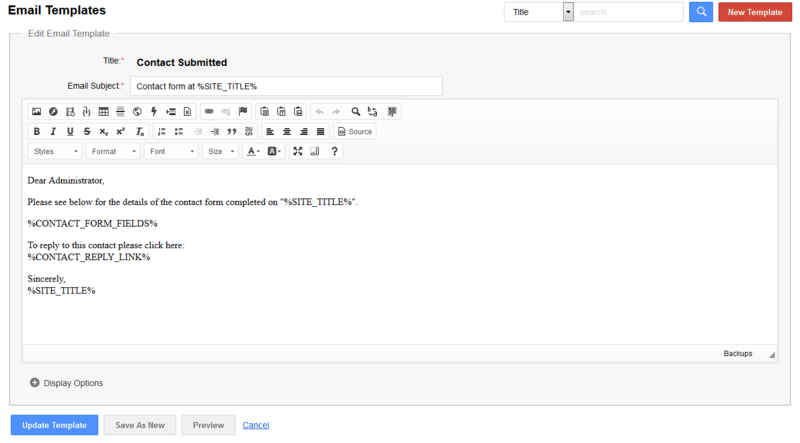 Clicking on the press release title will display details like Category, Title, URL, Status, etc. The Preview button is available by clicking on any individual row in the given section/module. It will be a blue button in the right corner and allow you to preview how the press post will look on the front-end before publishing it. The New Press Post button in the right corner allows the admin to create a new press release to display on the front-end of the website. The Edit button in the right corner allows the admin to edit the press release's event information, such as the Category, Title, Featured Image, URL, Description, etc. The PDF Attachment field allows the admin to upload a digital copy of the original source file by clicking on the Browse button and uploading a PDF to the website. The SEO Options section allows the admin to add or edit the Meta Title, Meta Keywords, Meta Description, and Canonical URL of the press post. This option allows the admin to define related press posts to appear at the bottom of each particular press post page. If you want to show your visitors other posts that are related or similar to the one you are publishing, this is the place to do just that. The Preview button is available by clicking on any individual row in the given section/module. It will be a blue button in the right corner and allow you to preview how the press category will look on the front-end before publishing it. The "priority" box can be used to set the Category priority. Enter a numerical value in ascending order and push Update button to change the order that the press categories and entries appear on the front-end. This settings tab includes all the common settings of the particular module/section. For example, the admin can set the number of press posts per page, the featured image size, as well as social media settings like enabling Facebook, Twitter, and Google+ buttons, etc. Sometimes, basic is better. For companies who want to showcase a condensed menu list of products and services, FICMS’ Quick Menu module provides menu functionality without photos, in a full-page list sortable by category. Creating new Quick Menu categories & items in FICMS is easy. Just login to the FICMS admin panel and click Quick Menu under the content section/module and it will display the list of all categories created. Clicking on the category name will display details like Title, URI, Status, etc. The Edit button in the right corner allows the admin to edit category information like the Title, URL, etc. to be displayed on the front-end. From this section, the admin can set the status of a category to Active as well as set the priority for each record. The "priority" box can be used to set the Page priority. Enter a numerical value in ascending order and push "Update Category" to change the order that the quick menu categories appear on the front-end. The SEO Options section allows the admin to add or edit the Meta Title, Meta Keywords, Meta Description, and Canonical URL of the quick menu categories. The Edit button on the right corner allows the admin to edit category information like the Title, URL, etc. The "priority" box can be used to set the quick menu item priority. Enter a numerical value in ascending order and push "Update Category" to change the order that the quick menu categories appear on the front-end. This settings tab includes all the common settings of the particular module/section. For example, the admin can choose to display or not display the categories, number of items per page, number of categories per column, number of items per column, currency symbol, currency position, etc. The FICMS Staff module is a great way to manage a listing of your company's management team and staff members. You're able to display names, titles, bios and individual avatar images. To access this module click on Staff below the Content main menu tab. The Staff Categories tab is the initial view of this module and is where you add new categories or edit and manage existing categories. To create a new Category click on the red New Staff Category button in the upper right area of the admin above the list. Clicking on an individual category listing will expand to show details about it as well as a blue Preview button. To the right under the Members column is an icon with a dark circle that contains a digit. That digit is the number of records within that category. You can click that number within the circle to view the list of records within that category. To edit a category click on the associated icon under the Edit column to the right. Clicking the red New Staff Category button will open a blank record. Click the Edit icon to open and edit an existing record. The Title field is where you enter the name you want applied to the category. The URl is the direct module page for that category. It will open a page that displays only the records within that category. The blue Open button will open this view in a new tab. This area allows you to edit the description of the category. The editor has two options, the WYSIWIG editor and the Source code editor. To toggle between the two editor simply click the Source button. Whatever content you place here will display with the category items list. The Active box must be checked to publish the category so it displays on the front-end. The Columns box allows you to set the number of columns the records will layout within. The Priority field allow you to select the position of the specific category is placed. The Staff Members area display the list of individual records within the module. This list can be filtered by category when you use the drop down selector above the list that shoes All by default. You can also search by name in the field to the left of the blue magnifying glass button. Clicking on any record will expand it to reveal the details and image associated with it, as well as the blue Preview and Edit buttons. To edit a record click on teh blue edit button or the icon below the edit column on the right side of the list. Clicking the red New Staff Member button will open a blank record. Select the Category the record should be assigned to from the selector drop-down. The Member's Name field is where you enter the team members full name. The URl is the direct module page for that record. It will open a page that displays only the records within that category. The blue Open button will open this view in a new tab. This area is where you enter the team member's title (designation), upload their avatar image, include a brief description or enter a full biography. In the Designation field, enter the team members job title or position. The Avatar upload field is for uploading the individual's image. Click Browse, find and select the image on your locale computer and click OK. The Description WYSIWYG editor enables you to enter a brief description about the individual. This description typically shows within the listing page. The Bio WYSIWYG editor lets you enter a full description. Entering content into this editor will automatically generate a 'Bio' button on the list page view along with the description. Users will click the Bio button to access the full detail for the profile including the Bio content. This section allows you to add or edit social media account URLs like Facebook, Twitter, Google+, and LinkedIn for an individual team member's profile. You can also add a personal website/blog URL, and e-mail address. Sharpen Avatar function will do just that if the box is checked. The Active box must be checked for the members profile to be published to the site. The Priority box is used set the position the record is within the category list. The SEO Options section allows the admin to add or edit the Meta Title, Meta Keywords, Meta Description, and Canonical URL of the specific record. Keep your important messaging front and center. Create and edit limitless banners with FICMS’ dynamic Content Sliders module. Color, content, size – you can update it all with the click of a button. Adding and editing sliders in FICMS is easy and flexible. After logging into the FICMS admin panel, just click the Content Slider section/module under the Media tab. Clicking on the slider group will display details like the Title, URL, Timeout, Status, etc. The Preview button is available by clicking on any individual row in the given section/module. It will be a blue button in the right corner and allow you to preview how the content slider will look on the front-end before publishing it. The New Slider Group button in the right corner allows the admin to create a new group. The Edit button in the right column allows the admin to edit the group information like Title, URI, etc. This area is used to edit the Content Slider Group description. This description is only visible on the "Content Slider" page under the content tab. The page is usually inactive, however if you view this page --> (yourdomain.com/content-slider) it will show you a summary listing of the existing groups within the module including Titles, Group Descriptions and Thumbnails of the slides they contain. Should you chose to make this module's content page active the description will display below the title. Editing the description can be done using the WYSIWYG editor or the Source code editor. You can toggle between both editors by clicking the Source button in the editor window. The Timeout field is used to set the time (in seconds) that the slides within a specific group are each visible for prior to transitioning to the next. To set the Content Slider Group slide dimensions, simply enter the number of pixels for both width and height. Checking the Auto-Play box will cause the slides to automatically cycle through upon the page loading. Uncheck the box to make the slide transition occur only upon clicking. Active Content Slider Groups are indicated by a checked box. Uncheck the box to make the group inactive. The "Priority" box will set the order in which the group is listed in the admin, as well as on he modules specific content page where all sliders are shown. To change the position of a group, enter a number in the Priority box. The SEO Options area allows the admin to add or edit the Meta Title, Meta Keywords, Meta Description, and Canonical URL of each Content Slider Group. While this functionality is present in the system, if you are not making the Content Slider Module Page active (visible to the public and search engines), then you can leave these fields blank. Selecting this tab will display a full list of slides in the system including thumbnail images. You can click on a slide name to view an example of the slide image, the assigned group, slide title, active status, creation date, last updated date, as well as the overlaying verbiage. Create a new slide by clicking the red New Slide button in the upper right corner. Edit an existing slide by clicking the edit icon in the right column. Open the Group drop down and select the desired group. Enter a title. This is used to identify the slide in the list view. Upload the slide image using the Featured Image Browse button. Select the image from your local machine and hit OK. Using the editor window you can add any overlaying content and/or buttons. Sharpen Featured Image Thumbnail check box: This only applies to how the thumbnail on the module's specific content page appear. The Active checkbox will activate an entry so that it can be seen on the front end of the website. Unchecking this box (deactivating) will stop the slide from displaying on the front end of the website. The "priority" box is used to set the sort order the slides appear in the slider rotation. Enter a numerical value in ascending order and push "Update Item" to change the order that the sliders appear on the front-end. The options in this tab are specific to how the groups display on the Content Sliders Group specific content page. If you are not displaying this page for public use, then these settings can be left alone. If you do make the page active and visible to the public, you have the ability to set the number of groups that appear per page and how many thumbnails appear per row. You'll also be able to set the slider group thumbnail dimensions. Gorgeous and low-maintenance? Of course it’s possible. FICMS’ Photo Gallery module makes it easy for you to bring elegant photo galleries to life with the click of a mouse. Creating and editing your own Photo Galleries in FICMS is extremely easy. Just login and click the Photo Gallery section/module from the Media tab. The initial view contains a full list of photo galleries you've created. These galleries contain groupings of images and help you organize them by event, date, topic, or any other way you see fit. Clicking on a gallery name will expand it to display the gallery details like Title, Direct URL, Accessibility, Status, as well as the Preview and Edit buttons. To the right under the Pics column you will see a number within a dark circle. This indicates the number of images that are within that gallery. Clicking that number will open the list of images assigned to that specific gallery. The New Gallery button in the right corner allows you to create a new photo gallery group. The Edit button in the right column allows you to edit gallery information like the Title, URI, etc. Enter the Gallery Title. This will display on the front end of the site and will be visible below the gallery thumbnail image. The system allows you to create galleries within galleries, known as sub-galleries. To assign a gallery as a sub-gallery to a 'main' gallery, simply click on the Sub Gallery of: drop down menu to reveal a list of all groups that already exist in the system. Click the gallery you want to assign the one you are editing/creating under. The URI field is used to define the photo gallery URI or 'slug', for example: http://www.ficms.co/photo-gallery/my-photos. The Description editor window allows you to add and/or edit the description of a photo gallery. There are two options, the WYSIWYG editor and the Source code editor. To toggle between the two, just push the Source button. Each gallery has accessibility options that enable you to assign the type of users that can access it. This means the general public user (everyone), logged in users (that had site credentials), administrators, etc. The gallery module includes the functionality that allows visitors to see the 'actual size' image (if larger than display view), the ability to download the image with a click of a button, as well as leave comments. To disable the comments functionality that allows users to post publicly displayed comments to images, just check the Disable Comments box. To disable the ability for users to see the 'actual size' image or download a copy, just check the Simple Gallery box. To make a gallery active and visible on the front of the website, just check the box next to Active. Always click the blue Update Gallery button to save your work. The SEO Options area allows you to add or edit the Meta Title, Meta Keywords, Meta Description, and Canonical URL of each Gallery. This information is accessible to search engines if the actual module page is published. If you are using content codes to insert a specific gallery directly into a content page, you can elect to leave this information blank as it is not accessible to the search engines. Clicking this tab displays all of the pictures previously uploaded to the photo gallery module. To filter images by a specific gallery, use the drop down menu that shows [All] above the list of images. Select the gallery name and the filter will automatically be applied. Clicking on the thumbnail image of an individual record will open the image within a lightbox as a preview. Clicking on the image name expands the record to show details like gallery name, title, description, if comments are allowed, is it active, and created and last modified dates. To edit a record, click on the edit icon in the right column. To delete, click the X in the right column. To upload a new image, click the red Upload Photos button a the top right of the screen. The red Upload Photos button in the right corner allows you to upload new images to a specific photo gallery. Select the Gallery that the image should be applied to. From the window showing your local folder where your images are, you can select one or multiple images to upload at a time and hit OK. The uploaded images will appear listed as thumbnails below the Browse button. Assign the title you want associated with the image. This will display when the image is opened and viewed in its lightbox. If you do not enter a unique title then the image file name will be displayed. An optional description editor allows you to enter a full description of the image. This too will display below the image and within the lightbox displaying the image. Important Note: If you upload multiple images at one time and enter a title and/or description, they both will display for each image you upload in the bulk process. If you want to have unique titles and/or descriptions for each of your images, you will need to upload the images individually or go back and edit the title and descriptions individually after the you have uploaded and saved the images. If Editing an existing image, you will see the optional Description editor within this area. You have the option to toggle between the WYSIWYG editor or SOURCE code editor. You will use this to add or edit descriptions once an image has been originally uploaded. Allow Comments is an option, that when active, allows users to leave comments below an image that are visible to other site users. What they post is immediately live. Sharpen Thumbnails is an option that when active does just what it says. This option makes your thumbnail images sharper, however this may increase thumbnail file size. Active, when checked publishes the image making it visible on the site. When unchecked the image is inactive and not visible on the site. The Priority box is automatically assigned a number based on the order (sequence) in which an image was uploaded to a gallery. To edit this 'priority' number also known as sort order, enter a numerical value for the position you want it to display within the gallery sequence and click "Update Photo" to save your record. 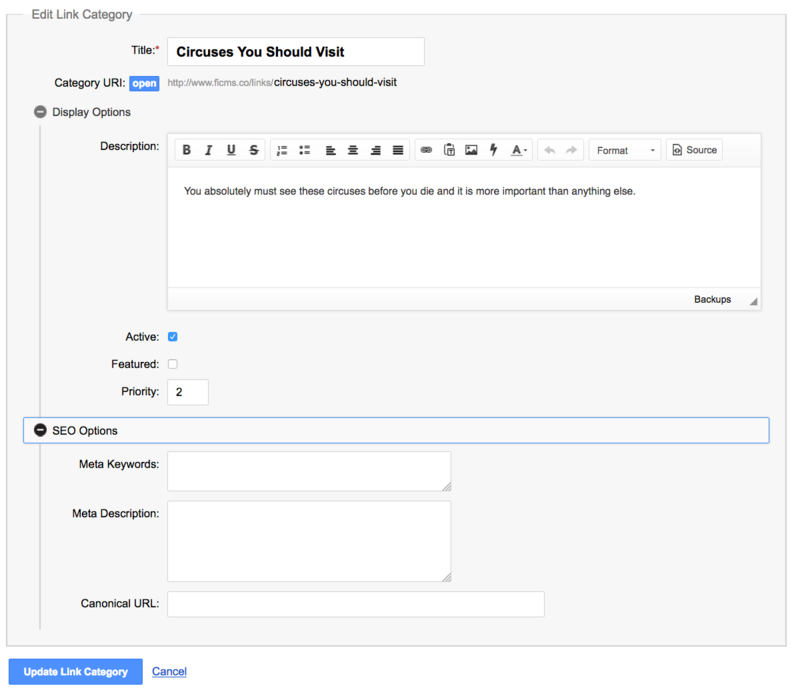 The SEO Options area allows you to add or edit Meta Keywords, Meta Description, and Canonical URL. 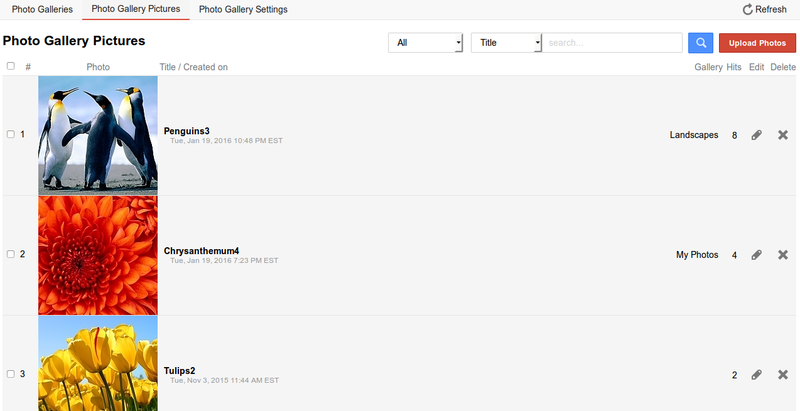 The Photo Gallery Settings Tab enables you to manage the common settings that are applied to all galleries. Pics per Page: Set the number of images that display on a single page without requiring users to click pagination to view more images on additional pages. The more you load on one page, the slower the page will load, especially for mobile users. Pics per Row: Sets the number of images that will display per row. Checking any of the three will display the respective social icon below the video enabling the viewer to easily share it on the social network selected. Front-row seat for your audience – back-end simplicity for you. Upload, organize and share videos easily with FICMS’ Video Gallery module. You get all the flexible perks of our Photo Gallery module, re-imagined for video content. Creating and editing your own Video Galleries in FICMS is extremely easy. Just login to FICMS and click Video Gallery section/module from the Media tab. The initial view contains a full list of video galleries you've created. These galleries contain groupings of videos and help you organize them by event, date, topic, or any other way you see fit. Clicking on a gallery name will display details like Title, URL, Accessibility, Status, as well as the Preview and Edit buttons. To the right under the Videos column you will see a number within a dark circle. This indicates the number of videos that are within that gallery. Clicking that number will open the list of videos assigned to that specific gallery. The New Gallery button in the right corner allows you to create a new video gallery group. The system allows you to create galleries within galleries, known as sub-galleries. To assign a gallery as a sub-gallery to a 'main' gallery, simply click on the Sub Gallery of: drop down menu to reveal a list of all groups that already exist in the system. Click the gallery you want assign the one you are editing/creating under. The URI field is used to define the video gallery URI or 'slug', for example: http://www.ficms.co/video-gallery/my-videos. The Description editor window allows you to add and/or edit the description of a video gallery. There are two options, the WYSIWYG editor and the Source code editor. To toggle between the two, just push the Source button. Each gallery has Accessibility Options that enable you to assign the type of users that can access it. This means the general public user (everyone), logged in users (that have site credentials), administrators, etc.. The gallery module includes the functionality that defines whether users as well as leave comments. Disable Comments: Checking this box disables the functionality that allows users to post publicly displayed comments to videos within the gallery. Simple Gallery: Checking this box will prevent the titles, descriptions and comments functions from display with the individual videos within that specific gallery. The Priority allows for setting the order in which the gallery is displayed among the other galleries. Simply enter the corresponding number. The SEO Options area allows you to add or edit the Meta Title, Meta Keywords, Meta Description, and Canonical URL of each Category. This information is accessible to search engines if the actual module page is published. If you are using content codes to insert a specific categroy directly into a content page, you can elect to leave this information blank as it is not accessible to the search engines. Clicking this tab displays all of the videos previously uploaded to the Video gallery module. To filter videos by a specific gallery, use the drop down menu that shows [All] above the list of images. Select the gallery name and the filter will automatically be applied. Clicking on the thumbnail image of an individual record to the video within a lightbox as a preview. To upload a new video, click the red Upload Videos button at the top right of the screen. The red Add Videos button in the right corner allows you to upload and/or embed new videos to a specific video gallery. By default the FICMS Video module provides the ability to paste in the direct link to a video that has been previously uploaded to a video sharing service like YouTube, Vimeo or the like. This is the preferred method to ensure your site's peak performance as streaming video directly from the website server may slow down your user's experience. To embed a video from a video sharing site, most have a "Share" button, that when click will generate a link to your video. Copy that URL/link and paste it into the Video URL field within the module. Should you decide not to go the suggested route of linking to videos on third party video sharing sites, You can upload your video and associated thumbnail image directly to the site. Your video will play using display controls native to the system. Video File: Click the Browse button to locate the video file on your local computer. Once located, click on it and press OK. You will see the file path replaces the words "No file selected.". There is a 50MB restriction on the size of video files that can be uploaded directly to your site. If your video exceeds this limit, then you'll need to use the default method and upload the video to an external sharing service. Thumbnail: This can be any standard image file format (.jpg, .gif, .png) and should be similarly sized to the preset size of the gallery thumbnails. Sharpen Thumbnails is an option that when active does just that what it says. This option makes your thumbnail images sharper, however this may increase thumbnail file size. Title: Use this to assign a title that you want associated with the video. This will display when the video is opened and viewed in its lightbox. If you do not enter a title in this field and uploaded a file directly to the site, the file name will display as the title. If you pasted in an embed link from a video sharing site, and do not enter a title into this field, the title used on the video sharing site will display. Description: This optional description editor allows you to enter a full description of the video. This too will display below the video and within the lightbox displaying the video. Important Note: If you upload multiple videos at one time and enter a title and/or description, they both will display for each video you upload in the bulk process. If you want to have unique titles and/or descriptions for each of your videos, you will need to upload the video individually or go back and edit the title and descriptions individually after the you have uploaded and saved the videos. Allow Comments: This is an option, that when active, allows users to leave comments below a video that are visible to other site users. What they post is immediately live. Active: When checked this publishes the video making it visible on the site. When unchecked the video is inactive and not visible on the site. The SEO Options section allows the admin to add or edit the Meta Title, Meta Keywords, Meta Description, and Canonical URL of the video galleries and videos. The Video Gallery Settings Tab enables you to manage the common settings that are applied to all galleries. Video per Page: Set the number of video thumbnails that display on a single page without requiring users to click pagination to view more video thumbnails on additional pages. The more you load on one page, the slower the page will load, especially for mobile users. Videos per Row: Sets the number of video thumbnails that will display per row. Video's Width: Sets the width of the video player in pixels. Video's Height: Sets the height of the video player in pixels. The FICMS Portfolio module empowers you to catalog and display your best work online with ease. This intuitive module lets you create new portfolio categories, upload new entries and edit your settings via one simple interface. Managing your portfolio in FICMS is very easy. Just log into FICMS and click Portfolio section/module in the Media tab. The initial view contains a full list of portfolio categories you've created. These categories contain groupings of portfolio entries and help you organize them by any way you see fit. Categories can include, but are not limited to project types, service types, and product types.This module can be used to manage case studies, product catalogs and just about any other content you want organized in a manner that is both easy to manage, as well as display and navigate for the user. Clicking on a portfolio category name will display details including the Title, URI, Status, and description, as well as the Preview and Edit buttons. To the right under the Entries column you will see a number within a dark circle. This indicates the number of portfolio entries that are within that category. Clicking that number will open the list of portfolio entries assigned to that specific gallery. The New Portfolio Category button in the right corner allows you to create a new portfolio category. The Edit button in the right column allows you to edit category information like the Title, URI, etc. When creating or editing a Portfolio Categories.. Enter the Category Title. This will display on the front end of the site within each portfolio entry, as well as within the category drop down selector. The URI field is used to define the category URI or 'slug', for example: http://www.ficms.co/portfolio/architecture. This URI is a direct link to the portfolio, which is then sorted to display only entries within that category. By default the system uses the name entered for the category, however this can be edited as needed. The blue Open button to the left of the URI field, opens that portfolio category's specific page. The Description editor window allows you to add and/or edit the description of a portfolio category. There are two options, the WYSIWYG editor and the Source code editor. To toggle between the two, just push the Source button. The Priority allows for setting the order in which the category is displayed among the other categories. Simply enter the corresponding number. Always click the blue Update Portfolio Category button to save your work. 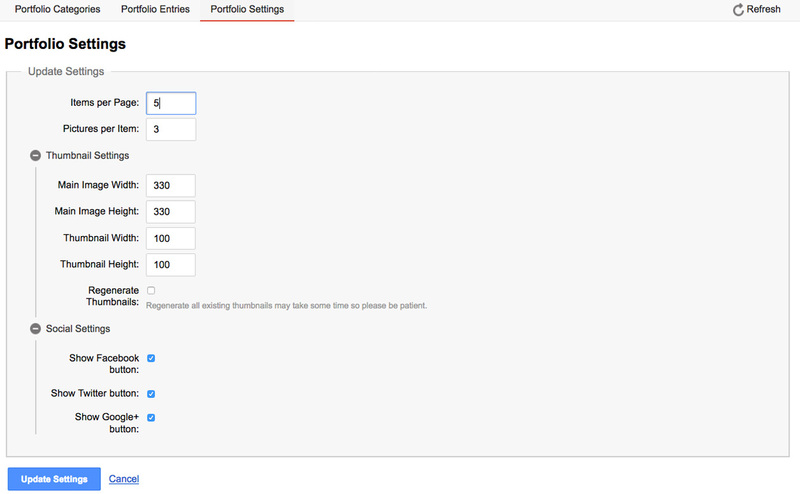 Clicking this tab displays all of the portfolio entries previously entered into the Portfolio module. To filter entries by a specific Categories, use the drop down menu that shows [All] above the list of entries. Select the category name and the filter will automatically be applied. You can search by entry specific content, by selecting a search parameter from the drop down with [Title] and entering the content to search against it in the field to the right. Clicking on the thumbnail image or entry title expands the record to show details like category, title, description, entry URI, project related external URI if applicable, and active status. This will also display the blue Preview and Edit buttons. To edit an existing entry, click on the edit icon in the right column. To delete, click the X in the right column. To add a new entry, click on the red New Portfolio Entry button at the top right of the screen. The red New Portfolio Entry button in the right corner allows you to create a new portfolio entry. Select the Category that the entry should be applied to. Enter the Title you want associated with the portfolio entry. The URI field will be automatically populated using the title you enter. The blue Open button to the left of the URI field will open the entry in a separate window for review. The Description editor window allows you to add and/or edit the description of a portfolio entry. There are two options, the WYSIWIG editor and the Source code editor. To toggle between the two, just push the Source button. This area allows you to enter images, list highlights we call 'innovations', an entry related URL, as well as an option completion date. The Innovations text area, is used to call out special features of the portfolio entry. Content will wrap, however hitting the enter key will move the cursor down to the next line. The URL field allows you to link to an external website, document (such as PDF) or a page within the website. Use this to direct people to important information or examples of work. URLS should be complete and include http:// or https://. The Completed On box enables you to include a completion date for those portfolio entries where the highlighting when the work was completed is an important element. This area enables you to enter a single testimonial related to the portfolio entry. The Testimonial text field is used to enter the testimonial content. There is no formatting options. This is preset by the module. The Testimonial By field is where you enter the name of the person that provided the testimonial. 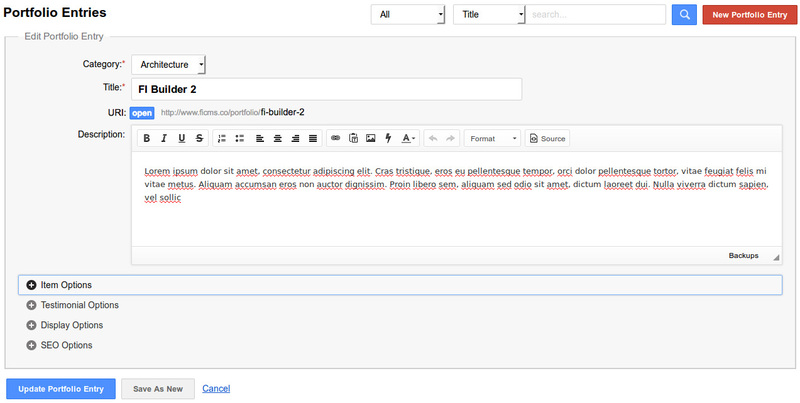 Like the testimonial itself, the formatting it preset by the module. Active, when checked publishes the portfolio entry making it visible on the site. When unchecked the portfolio entry is inactive and not visible on the site. The Priority box is automatically assigned a number based on the order (sequence) in which a portfolio entry was created and assigned to a category. To edit this 'priority' number also known as sort order, enter a numerical value for the position you want it to display within the category sequence and click "Update Portfolio Entry" to save your record. The SEO Options section allows you to add or edit the Meta Title, Meta Keywords, Meta Description, and Canonical URL of the specific portfolio entry. The Portfolio Settings Tab enables you to manage the common settings that are applied to all categories. Items per Page: Set the number of entries that display on a single page without requiring users to click pagination to view more entries on additional pages. The more you load on one page, the slower the page will load, especially for mobile users. Pictures per Row: Sets the number of images that will display per row. Regenerate Thumbnails: When checked and the Update Settings button clicked, all thumbnail images will be regenerated. QR Codes? Yes. Coding? No. FICMS’ QR Codes module allows you to effortlessly generate working QR codes. Use QR codes as virtual business cards, or include on product labels, sales sheets, T-shirts, banners and other promotional materials. Just login to FICMS and navigate to the QR Code section/module under the Media tab. The initial view contains a full list of QR Code Categories you've created. These categories contain groupings of QR Codes and help you organize them by any way you see fit. Clicking on a QR Code category name will display details like Title, admin URI, Status, as well as the Preview and Edit buttons. To the right under the Codes column you will see a number within a dark circle. This indicates the number of QR Codes that are within that category. Clicking that number will open the list of QR Codes assigned to that specific Category. The New QR Code Category button in the right corner allows you to create a new QR Code category. The red New QR Code Category button in the upper right corner allows you to create a new QR Code category. Enter the Title to the QR Code Category. The URI field is used to define the category URI or 'slug', for example: http://www.ficms.co/qr-codes/example. This URI is a direct link to the category, which is then sorted to display only entries within that category. By default the system uses the name entered for the category, however this can be edited as needed. The blue Open button to the left of the URI field, opens that QR Code's category's specific page. The Description editor window allows you to add and/or edit the description of a QR Code category. There are two options, the WYSIWYG editor and the Source code editor. To toggle between the two, just push the Source button. To make a category active and visible on the front of the website, just check the box next to Active. Always click the blue Update QR Code Category button to save your work. The SEO Options area allows you to add or edit the Meta Title, Meta Keywords, Meta Description, and Canonical URL of each Category. This information is accessible to search engines if the actual module page is published. If you are using content codes to insert a specific category directly into a content page, you can elect to leave this information blank as it is not accessible to the search engines. Clicking this tab displays all of the QR Code entries previously entered into the QR Code module. Clicking on a QR Code Thumbnail will open the code in a lightbox revealing a larger version of it. Clicking on the QR Code Title line expands the record to show details like category, title, description, entry URI, code type, and active status. This will also display the blue Preview and Edit buttons. To add a new entry, click on the red New QR Code button at the top right of the screen. The red New QR Code button in the right corner allows you to create a new QR Code entry. Select the Category that the QR Code should be applied to. Enter the Title you want associated with the QR Code. This area is where you set the type of QR Code you are creating. This includes URL, E-mail, Call (action), SMS, and Text and is assigned via the drop down selector. The value, or information contained within the QR Code, is entered into the 'value' text area, and should pertain to the "Type" of QR code being created. For example, if you are creating a "URL" QR Code, you'll want to enter a URL into the Value field, such as: http://www.yourwebsitehere.com. Active, when checked publishes the QR Code for use. When unchecked the QR Code entry is inactive and not visible on the site. The Priority box is automatically assigned a number based on the order (sequence) in which a QR Code entry was created and assigned to a category. To edit this 'priority' number also known as sort order, enter a numerical value for the position you want it to display within the category sequence and click "Update QR Code" to save your record. The SEO Options section allows you to add or edit the Meta Title, Meta Keywords, Meta Description, and Canonical URL of the specific QR Code entry. The QR Code Settings Tab enables you to manage the common settings that are applied to all categories and within the QR Code module content page. Codes per Page: Set the number of codes that display on a single page without requiring users to click pagination to view more entries on additional pages. The more you load on one page, the slower the page will load, especially for mobile users. Codes per Row: Sets the number of images that will display per row. 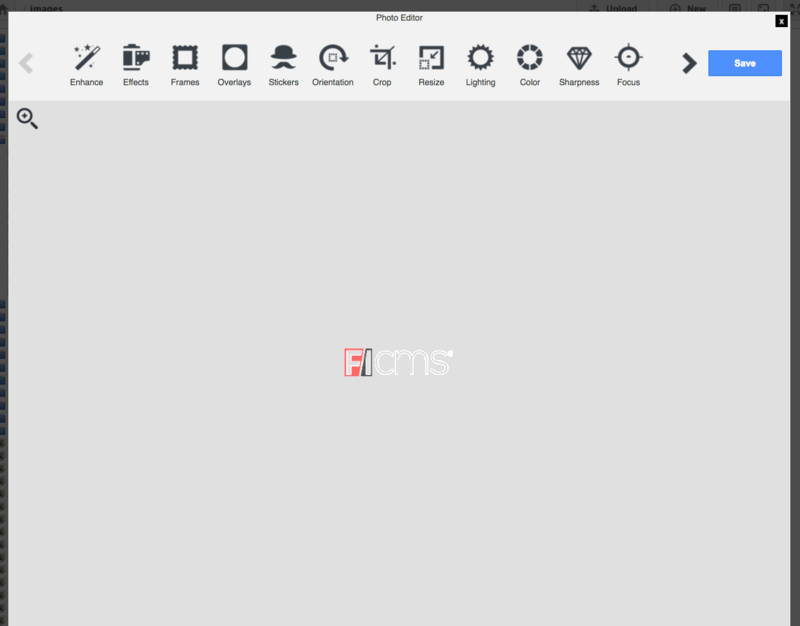 FICMS’ integrated File Manager module allows you to easily upload new images and document files, as well as manipulate the folder structure used to organize them. Beyond organization, FICMS allows you to edit and manipulate your image files directly within the system. The “File Manager” initial screen contains two views to of the same information. The left side bar contains collapsible folders that expand and drop-down to show the files they contain. The window on the right shows folder icons and file thumbnail images. Both views are easy to follow making which ever you choose to use a matter of your personal preference. Image Editing: Enhance, add effects, resize, crop, draw and add text to images. Right-clicking on a file/folder will give you the option to cut, copy, paste, rename, and delete. After you've uploaded a file, it will appear within the folder you've assigned it to. To select a file or image, simply click on it once. 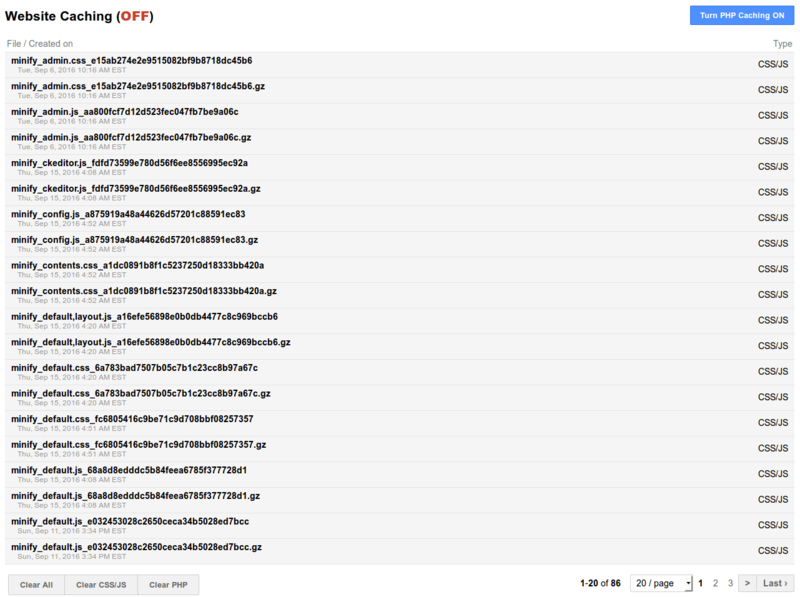 You will be shown the file along with details about it including direct url path, file size and options to choose from. You can edit images, cut and paste it into a different folder, make a copy, download it, rename it or delete it. You can use this as a file repository, thus you can copy a direct url path and paste it into emails so others can directly access the file. Through the robust image editor, you can crop, resize, lighten, darken, add effects and change the colors of your images. There are many options to choose from so we advise you just start playing with it. Be sure to click the blue Save button which will create a new version of your altered image. 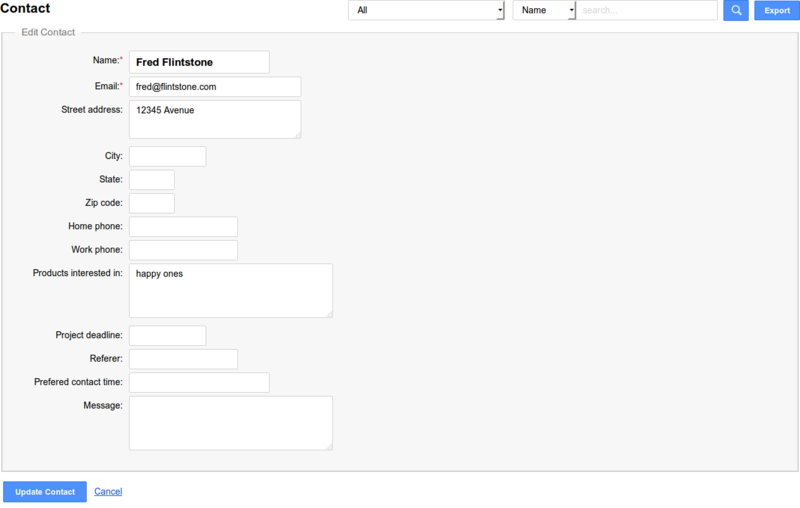 The FICMS Contact module provides a specific form that's used on the Contact Page to help facilitate communication with your site's users. This form obtains basic user information while providing an area for their comments and/or inquiries. Every time a user submits the contact form you'll receive an email notification containing all of the provided information. In addition to the email you'll receive, all of that information is also stored within the Contact module database providing a central location to access a full list of submission. An added benefit to storing these submissions in the database is that they can be exported as a .CSV file for use within Excel or other third party systems. That means no need to copy and paste information from all the emails into a spreadsheet or CRM. Just hit Export! You'll find the Contact Manager under the Communications tab in the main menu. Click on a specific record will expand the view to display the submission details. 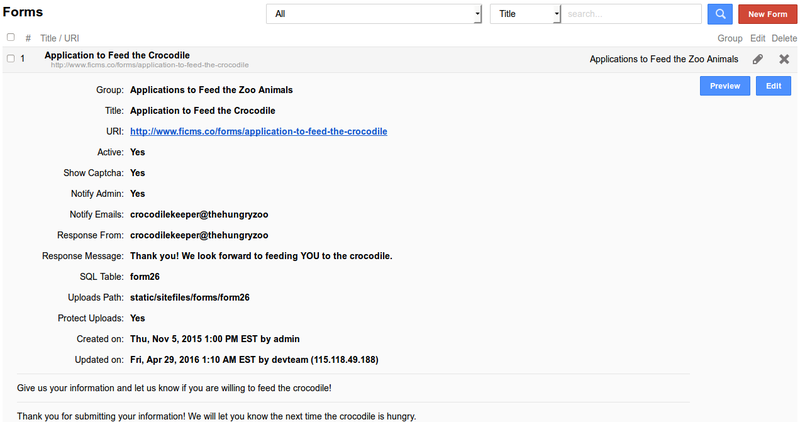 The submission list view shows the persons name, emails address and the date/time it was submitted. The Status column on the right side lets you assign a status to a record such as replied, spam, or approved. The Reply column shows one of two indicator icons. Dark means there have been no replies sent to the submitter through the module. Light means one or more replies have been sent to the submitter using the system. These replies can be seen by clicking on the record. The Edit column icons are used to access the individual record details so you can edit the information within it. Clicking the envelope icon in the right column under Reply allows you to respond to the submission directly from the Contact module. The To field is already populated with the submitter's email address. The Subject field is pre-populated with (RE: Contact form at - Your Sites' Name). This can be edited as desired. Use the WYSIWYG editor to draft your message. You can insert links, images, as well as work directly within the HTML Source by clicking the Source button. Click Send Reply to send your message or cancel if you changed your mind. The Edit option, accessible by clicking the edit icon in the right column, allows you to edit the contact information the user submitted. When you are finished editing, be sure to click the blue Update Contact button to save your changes. Login to the FICMS account and click the newsletter section from the communications menu. 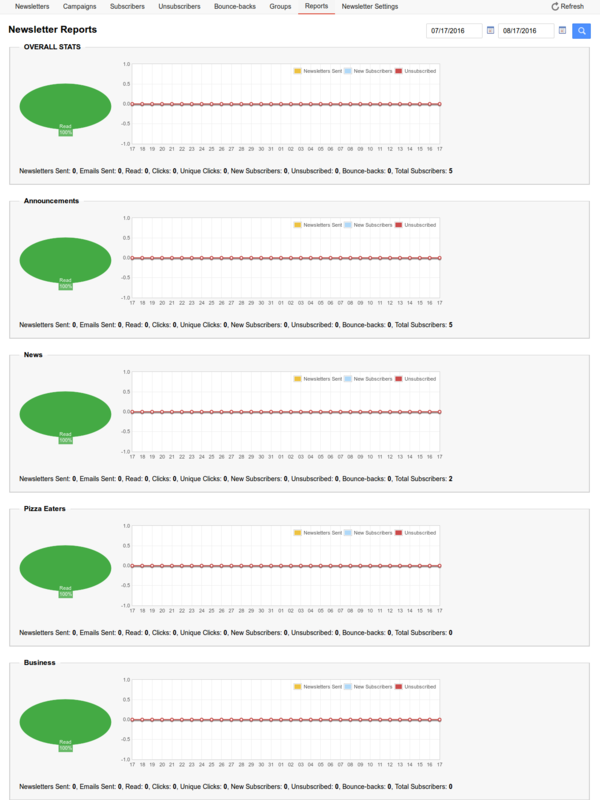 It display all the scheduled and sent newsletters. Clicking the newsletter name displays details like From address, To address(es), Email Subject, Created date, etc. Click the Preview button to display the Preview of how the newsletter looks. The New Newsletter button in the right corner allows the admin to add a new newsletter. Choose the right template for the newsletter in the Template section along with the relevant email subject. 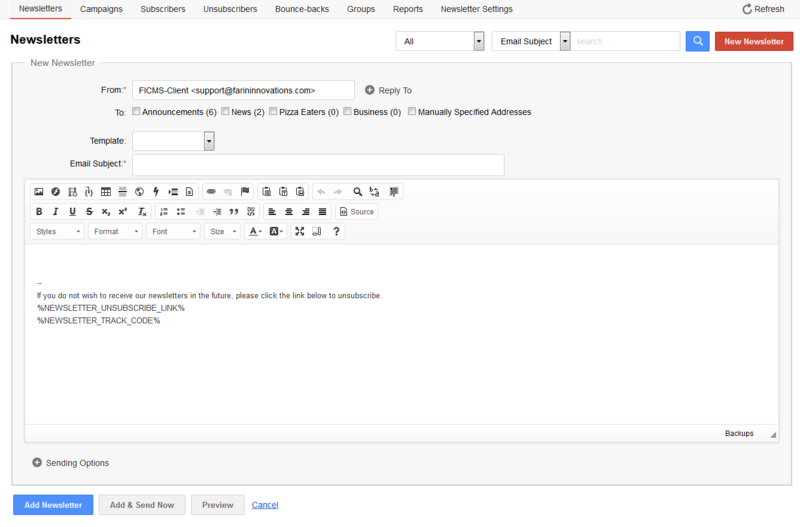 Sending options - Admin can configure the number of emails to be sent for an hour using this option. Pause will suspend sending emails. Add & Send Now button will update the newsletter and send it to the groups selected. Edit button in the right corner allows the admin to edit newsletter information like From, To, Email Subject, and Newsletter body. The newsletter body has two editing options, the WYSIWIG editor and the Source code editor. Using the Source button, the admin can toggle between the editors. 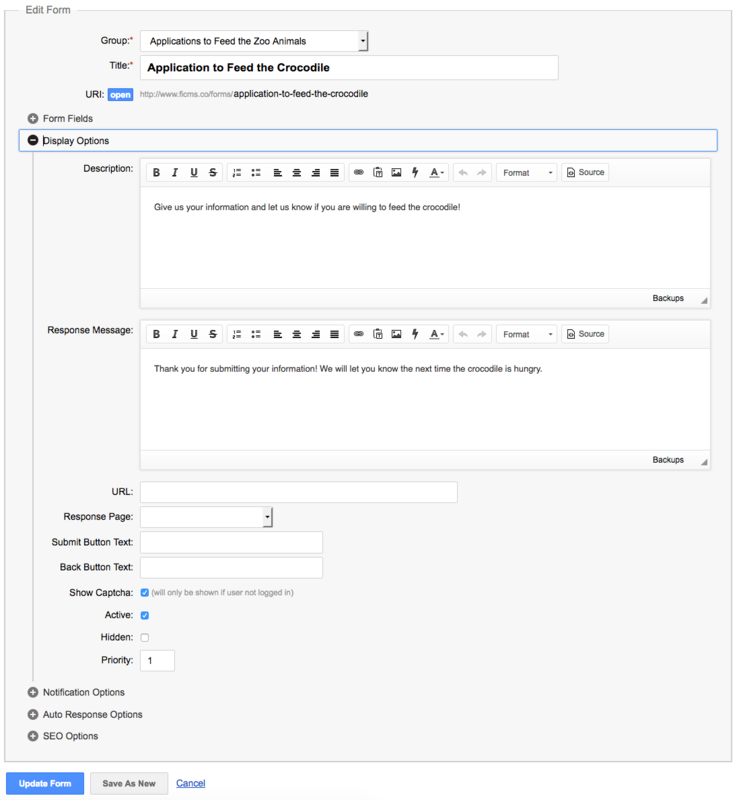 Sending Options allows admin to set the number of emails sent per hour, and also radio buttons to select Resend and Pause. Click the Campaigns tab to display all the campaigns. Clicking the campaign name displays details like From address, To address(es), Email Subject, Created date, etc. Click the preview button to display the preview of how the campaign looks. Edit button in the right corner allows the admin to edit campaign information like From, To, Email Subject, and Newsletter body. The newsletter body has an editor with two options, namely the WYSIWIG editor and the Source code editor. Using the Source button, the admin can toggle between the editors. Campaign Options allows admin to specify how many days to wait before sending the newsletter to subscribers. Clicking the Subscribers tab displays all the subscribers. Click the Subscriber's name to display details like Groups, First/Last Name, Company, Email, etc. The Edit button in the right corner allows the admin to edit Subscriber information like First/Last Name, Company, Email, Groups, etc. Clicking the Unsubscribers tab displays all the subscribers to the service. Clicking a subscriber name displays details like Groups, First/Last Name, Company, Email, etc. The Delete button allows admin to delete the entire record. Edit button on the right corner allows the admin to edit the Unsubscriber information like First/Last Name, Company, Email, Groups, etc. This tab has the list of invalid email IDs that have bounced back. The Newsletter Groups tab has all the records of the groups created. Clicking on the Group name displays related information like Title, URL, Status, etc. Clicking the Preview button in the right corner opens a new tab that has the subscription page of the particular group. Clicking the Edit button on the right side allows the admin to edit the group’s information like Title and URL. This section allows admin to edit the description. The editor has two options, namely the WYSIWIG editor and the Source code editor. Using the Source button, the admin can toggle between the editors. 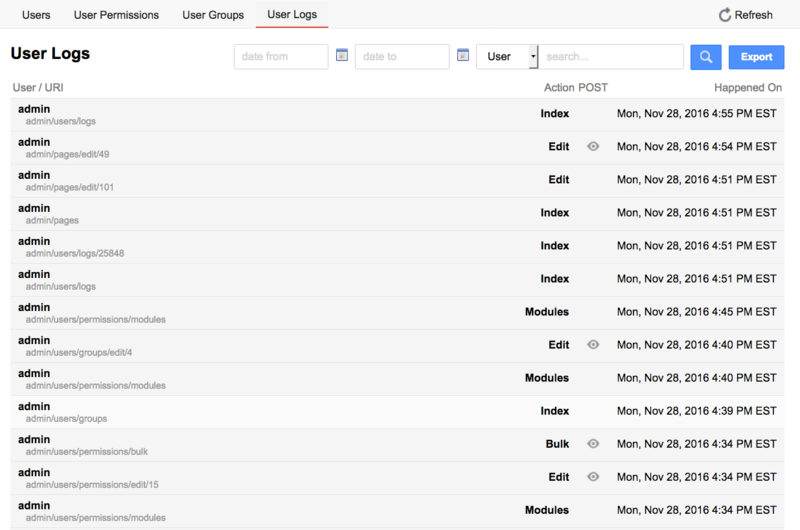 It also allows the admin to set the status of the category to Active and set the number of columns and priority. 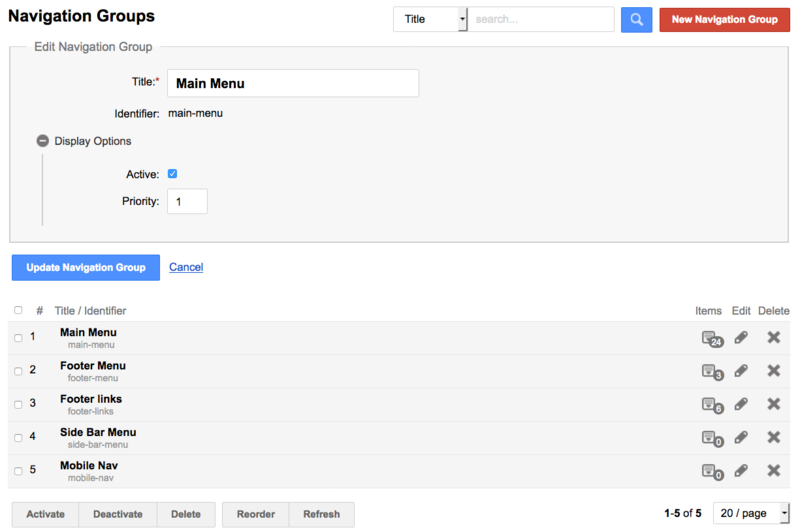 SEO Options section allows admin to add or edit Meta Keywords, Meta Description, and Canonical URL. The Reports section displays the overall graph of the newsletters sent. Also, it displays graphs according to the Groups. It allows admin to see reports for a particular time period with the help of the calendar section available at the top right corner. This section contains the settings for delivering a newsletter. It includes fields like From Email, Max Emails Per Hour, Clicks, Tracking, etc. Email settings has a drop-down section with settings like Mail, SMTP, and Mailgun, which can be configured to the particular server. This section has a Handle Bounce-back box admin can check to enable a mail configuration option that handles returned emails. The configuration option has Mailbox Email, Mailbox Host, Mailbox Port, Mailbox Username and Password, etc. After logging in to your FICMS account, open Request Quote under the Communications menu. This menu has all the sections related to Request Quote page in the website. Clicking on the name displays the details of the requester. Clicking the reply button in the right corner allows the admin to respond to the query or the quote raised. Edit button in the right corner allows the admin to edit the requester information. The FICMS Form Builder module is a robust tool allowing you to create the forms of all sizes and complexities. Whether it is a single comment field or a multi-page registration form with hundreds of fields, this module and its accompanying features makes easy work of setting up a web form. To access this module select Form Builder from within the Communications tab in the main menu. You can manage form groups, individual forms, fields within forms and submissions effortlessly from this single interface. This function enables you to categorize your forms into 'groups' for make organization easy. 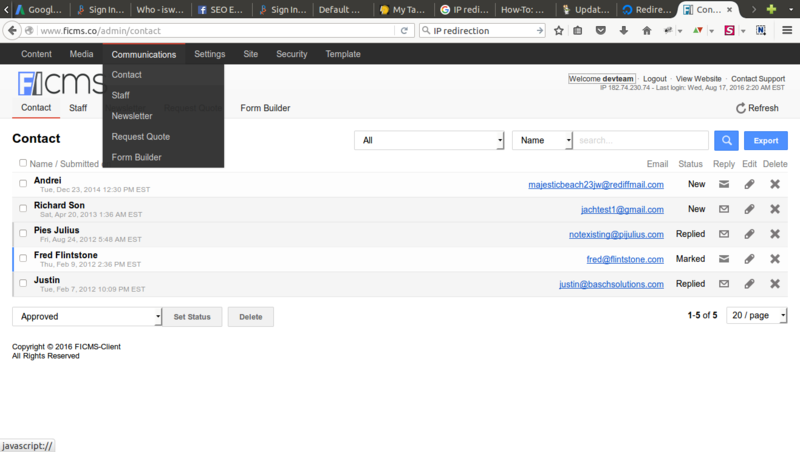 It is accessed as the first item under the Form Builder section under the Communications tab under the main menu. Click the red New Form Group button in the top right area of the admin to create new form groups. Clicking on a specific group expands the view to displays details like its Title, URL, Active status, Description and Preview button. Clicking the blue Preview button will display a front-end page containing the description and a list and links to the forms within that specific group. The Forms column on the right contains dark circles with light numbers. The numbers indicate how many forms are within that group. This circle acts as a link that will displays a list and provides direct access to those specific forms. The Edit column contains an icon link that opens the specific groups in order to edit their details. To Delete a group, click on the X in the far right Delete column. The Title field contains what will display in the form list as well as above the form on the front-end. 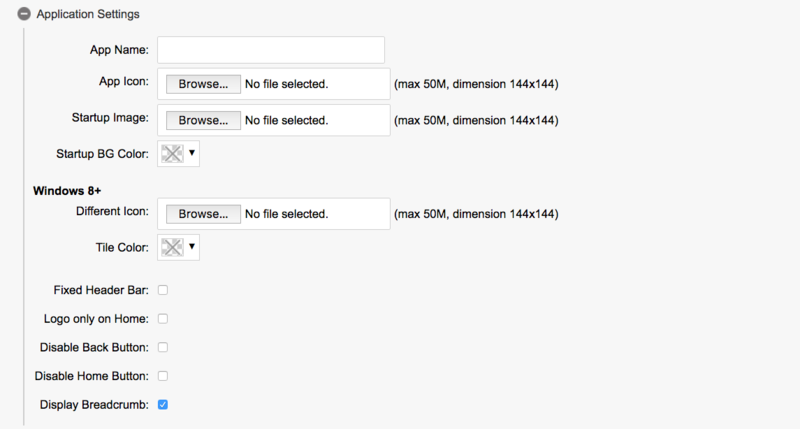 The Sub Group of drop down allows you to make sub-groups to further organize your groups. Simply select the existing group from the drop down that you want to assign your new form under. The URI is the direct link to the form group. The page will display the title, description and list of forms within that group. Clicking on the blue Open button, will open the form in a new window for review. Within the Display Options area is the group Description editor, Active toggle and priority field. The Description WYSIWYG editor enables you to add a description for the group. The group description only displays when/if viewing the main forms page. This page is generated automatically when the module is installed, however is not usually displayed to the public. Most forms are embedded individually in to specifically related content pages. Check the Active box to publish the form and make it 'live', and uncheck the box to make it inactive and unpublished. The Priority field allows you to set the order in which the forms appear within the group. The SEO Options section allows admin to add or edit Meta Keywords, Meta Description, and Canonical URL. 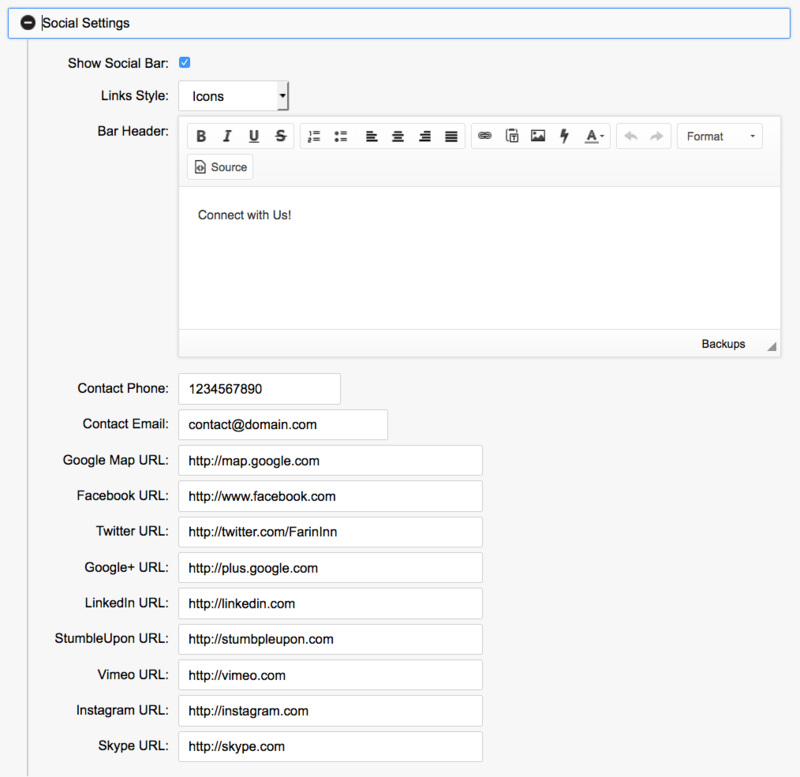 This functionality, which allows you to create and manage individual forms, is located within the Form Builder tab under the Communications main menu item. Here you will find a complete list of forms already in the system. They can be filtered by Form Group, or you can search for forms by name. 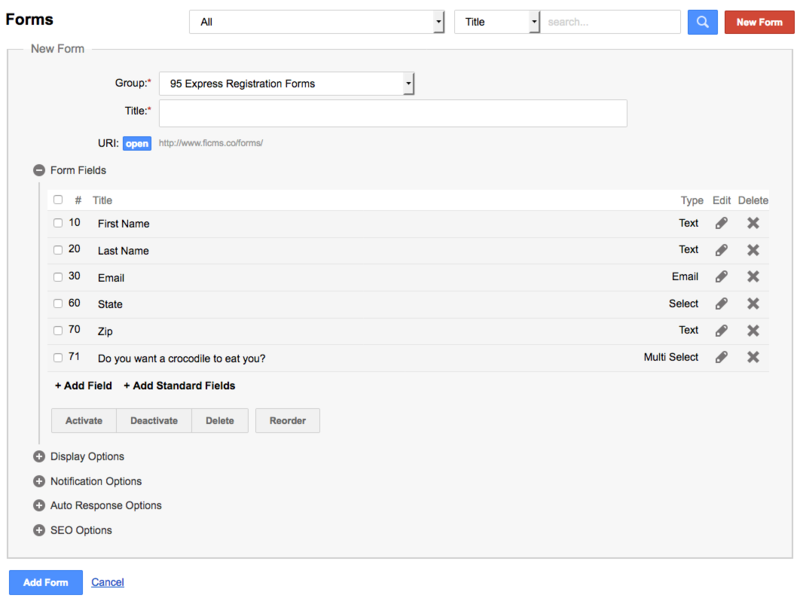 From this area you can add, edit or delete forms, expand a record to see details and preview the fields associated it. To create form click the red New Form button. 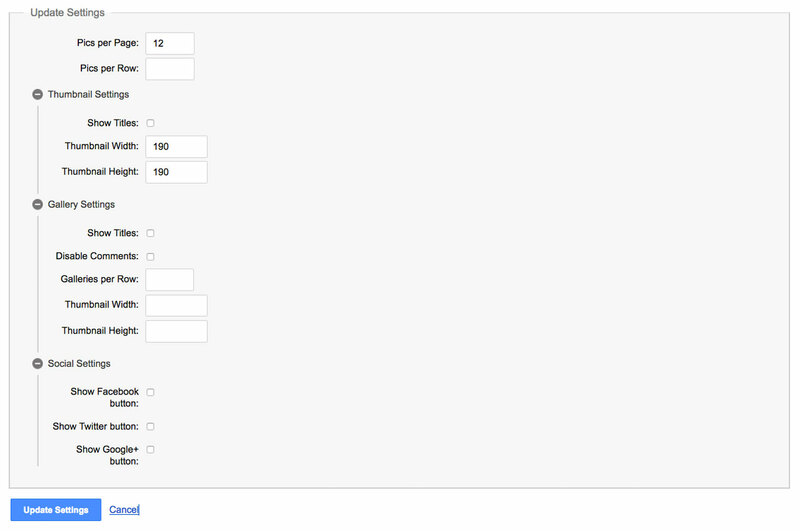 Form fields (simple view, not formatted as seen on front-end). This view also provides the blue Preview and Edit buttons. After clicking the red New Form button you will need to enter some basic information to get started. Select a form group (optional), or leave blank. Enter a title for the form. This will display at the top of the form. The URI is the direct link used to access the form if it is not being embedded into a specific content page. Click the blue Open button to see a preview of the form within the site template in a new window. Click the blue Add Form button to save the form. Once your form has been created, click the edit option to open it and begin adding field (questions). Important Note: As you edit your form, it is CRITICAL that you click the blue Update Form Button AFTER you edit or add a field. You do not have to do this after every action, however if you click the Update FIELD button on a specific item, it will NOT save to the form unless you click the Update Form Button. To prevent loss of work, it is suggested you click the Update Form Button as often as possible. Click the +Add Field or +Add Standard Fields links to add new fields to the form. Clicking the +Add Standard Fields link will open a window with a predefined list of fields that you can add in bulk. These include, First Name, Last Name, Email, Phone, Address, City, State, and Zip Code. Just check the boxes for the ones you want to include and click the blue Add Selected Field button. Be sure to click the blue Update Form Button at the bottom. To Deactivate a field, check the box to the left of the field and click the Deactivate button below the field list. To change the position of a field enter the new position number in the box to the left of the field under the # column, then click the Reorder button below the list. To create a new field, click the +Add Field link, which will open a black record. Select the Type of field you want from the Type drop down selector. Options include: Text field, Text area, Check boxes, Radio buttons, Selector drop down, Multi-select, Date, Date & Time, Email validated, Phone validated, Hidden, Password, Page Break, Static Text, File upload, Multi-file Upload, Text Editor, Jump to, and multiple button options. In the Title Field, enter the Field Name or Question. This is what will display on the front-end. 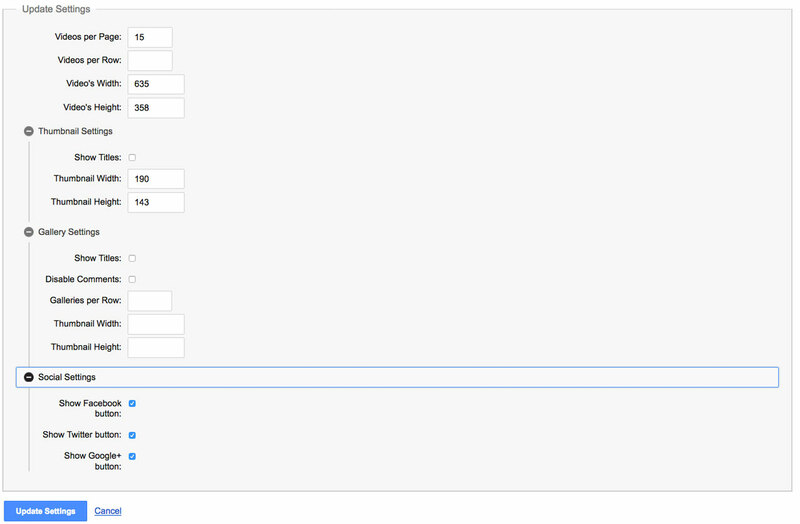 The Value text area is where you input the information you want to display within the type of field you selected (f.e. Check boxes, Radio buttons, Selector drop down, etc.). Separate each value on an individual line. Be sure there are no extra spaces following each value. The Required check box must be selected if you wish for a field to be required. This area allows you to apply various controls to the individual field. The Note WYSIWYG editor enables you to create a note that applies to and displays below the specifi form field. The Style field allow you to control the width and height of the text area for the 'text area' type option. The Class field provides a way for you to enter specific validation for information entered in to a field. The Viewable by drop down, allows you to assign if a specific field is only available logged in users or administrators only. The Full Line check box, when check, will display the field title stragith across and above the field or response type options. This is useful for long titles or questions that would otherwise wrap in a tight space. The Disabled check box, when checked, will prevent the information submitted to this field from being included in the notification email to the admin. The Searchable check box, when checked, will include the content within this field to be searchable with browsing the form submissions. The Preview check box, when checked, will include that field within the submission preview detail view. The Hidden check box, when checked, will hide the field from use. The Active check box, when checked, will include the field in the form and make it able to accept data. If unchecked, the field will not be included in the form, or resulting export. The Priority field sets the order of how the fields display. You can move the field around by changing the number. Be sure to click the blue Update Form Field button to save your work. You can easily create Sub Fields (sub questions) that apply to related and preexisting fields. These sub fields are only visible when triggered by the response of the related question. For example to find out what someone wants to eat, you first need to know what mean they want, so you ask, "Do you want: ( breakfast, lunch, dinner)". If they answer breakfast, s sub field containing breakfast options appears. If they selected lunch or dinner, then those related sub fields would display. This can perpetually keep drilling down. From the Sub Field of: drop down, select the existing field that you want to assign the current field as a sub field of. The Show on Value: text area allows you to select which values from the existing field will trigger the display of the sub field. You can select the sub field to be triggered by one or more of the available values of the existing field. The trigger values must match exactly to the values of the existing field. This means capitalization as well as any spacing. The form Display Options area enables you to control specifics about how the form itself displays and how the user interacts with it. 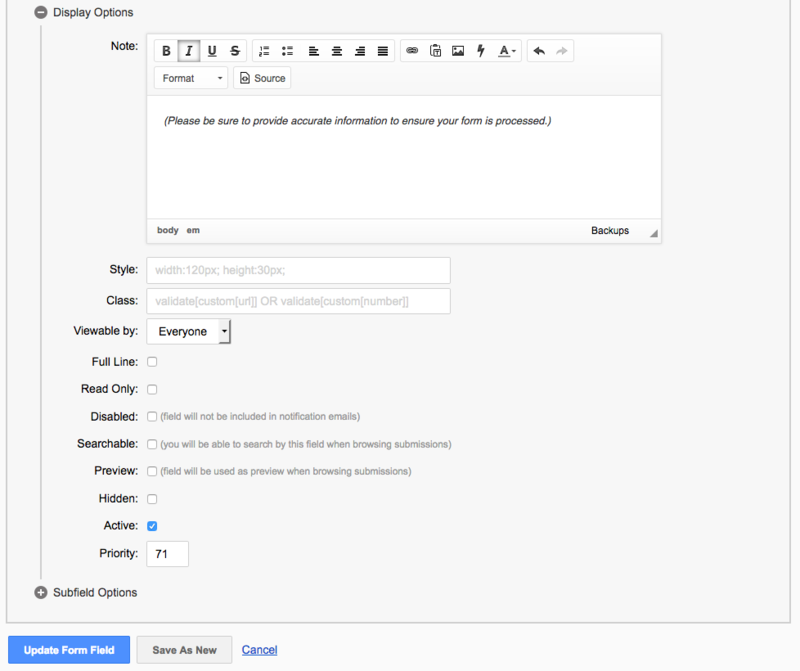 The Description WYSIWYG editor provides a way to include content on the form page above the fields. This can be used if using the specific form page, or if the form is embedded into a content page using the content code option. The Response Message WYSIWYG provides a means of crating a custom message that displays on the page after the form as been successfully submitted. This option is used if a Response Page is not selected. The URL field allows you to redirect users to a specific file or image within the site, or to an external website or landing page. The Response Page drop down provides a list of pages within the site you can choose to redirect the user to after the form is successfully submitted. You can customize the Submit Button and Back Button text, simply by entering the text you'd like into the related fields. To enable Captcha on a form you must check the box. If will display for all public, non-logged in users. The Active check box must be checked in order for the form to be visible to the public. A Hidden form is active, however not visible on the Form list page on the front-end. To hide a form, check the box. The Priority field sets the position the form lists on the form specific page and in the admin. Enter the number of the position you with the field to display in. This area is where you set where you want form submission email notifications to be sent. The Notify Admin check box is pre-populated with the email address set in the Global Settings as as the site administrator. This option is checked by default. If you do not with the site admin to receive the email notifications for a specific form you must uncheck the box. The Notify Emails text area allows you to assign any number of email address you want to receive the notifications in. One email address per line. 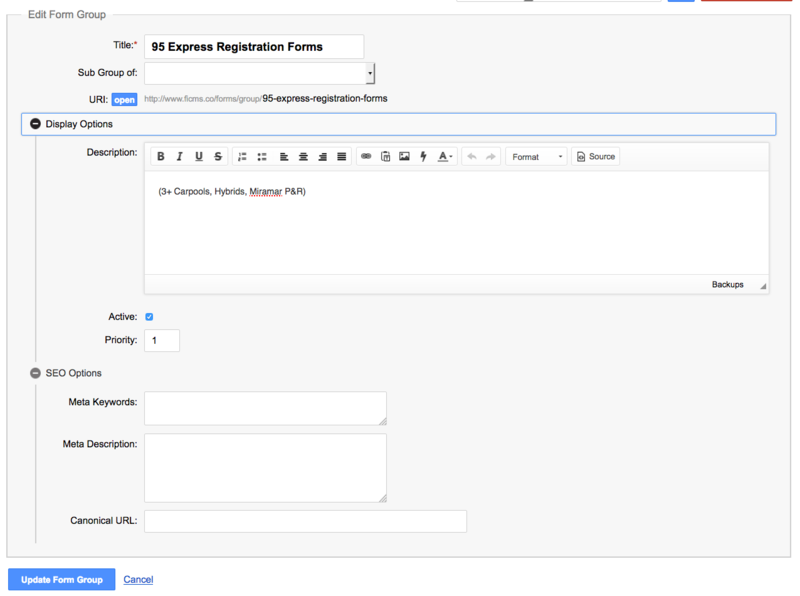 This functionality will automatically send the form submitter a acknowledgement reply upon the submission being saved. The Send Auto Response box must be checked in order for this function to operation. The Response From field allows you to enter a custom email address to show as the sender. The Response Message text area provides a space to enter a basic message (non-HTML). If you leave this area blank the general Response Message that appears on the page will be sent. Please not that if you do not include EMAIL as one of the form fields, then this functionality will not work. The SEO Options section allows you to add and/or edit the Meta Title, Meta Keywords, Meta Description, and Canonical URL of the specific form. This is only applicable if you are indexing the individual form pages. The form submissions are stored within the Contact module so you can review them at any time. All submissions can be exported on a per form basis. The initial view of submissions is set chronologically. To filter the list by a specific form use the drop down selector above the list set to All. Clicking this selector will display all of the forms available in the system. To search data within the submissions use the search field next to the magnifying glass. To review the data within any one submission just click on the record. The listing will expand to display all of the submitted information. To edit the data within a specific submission, click on the edit button. To export submissions, filter by the form name to display only desired form's submissions. Once filtered, click the blue Export button at the upper right portion of the admin area. This will prompt you to open or save the CSV file. If you are creating multiple forms on a repeated basis, you can make things easier by assigned new fields to the Standard Fields list. This will keep you from having to recreate the same fields over time and time again on each new form. By adding frequently used fields to the Standard Fields list you only have to check the associated box to include them in your form in one easy step. To add a new item to the list click the red New Form Field button in the upper right portion of the admin. Enter the title or question you want to appear. Enter any values needed for selector, radio buttons, check boxes, etc. If the field will be required, make sure the required box is checked. This will apply to all forms it is used within. Apply the display and sub field options as needed (see above for details). The Global Settings area of FICMS is packed with functionality that applies to the site overall and not specific to any specific module. Because the items contained in this area are 'global' in nature you should be careful when making changes and double check before saving. Site TItle: This is the meta-title for the site and is included in within the page specific meta-title for each page. From Email: This is the email that any email that is sent directly from the site will display as the 'From" or sender. Support Email: This is the email that will receive email notifications from modules by default.This is also the email used for the Contact Support link at the upper right of the FICMS screen. Be sure to click the blue Update Settings button to save any changes. This area controls the time and date of the site. This important for time stamps on data entries. Date Format: Sets how the date displays without the time. Time Format: Sets how the time displays without the date. FICMS comes with the logo/icons for the most popular social networks. You just need to enter the URL for your accounts into the associated fields and the logos will automatically appear within the footer and header of your site theme. In addition to social networks, this is where you enter your phone number and email address that display as part of your site theme. To remove any one item simply delete the URL or information and click the blue Update Settings button at the bottom of the admin to save your changes. Copyright Content - The content entered here displays are the copyright information within the footer of the website. Footer Content - Usually used for SEO purposes, the content entered here displays within the footer of the website. 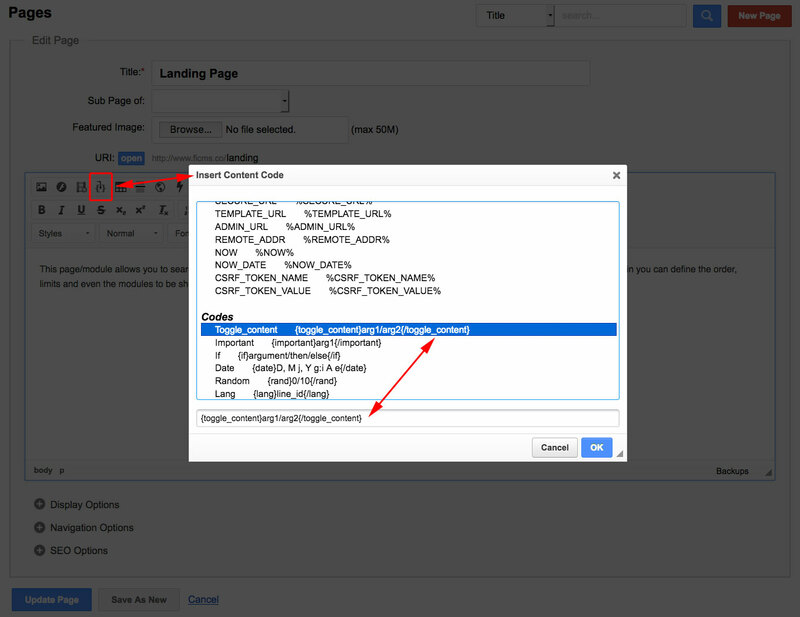 Google Analytics Code - Applying Google Analytics is as easy as pasting your tracking code into this text area. Meta Description - This is the default meta description for the site and is used when a page does not include something specific. Meta Keywords - This is the default meta keywords for the site and are used when a page does not include something specific. Custom Meta Tags - This enables you to add custom meta tags to the website. Multiple data-values can be input to display within the sites overall meta-data. Enable 404 Page - If you need 404 pages enable, this box needs to be checked or it will redirect to the home page by default. Decide which commenting system you want to enable on your website (Facebook or Disqus) and add your Disqus theme and shortname. This will display in the appropriate section of the website. Captcha is the widget task site users must complete to prove they are not a robot when submitting information. This is the area where you manage the site's Captcha specifications. Pick the system, the theme, and the language for the Captcha words to be used in forms with Captcha option enabled. 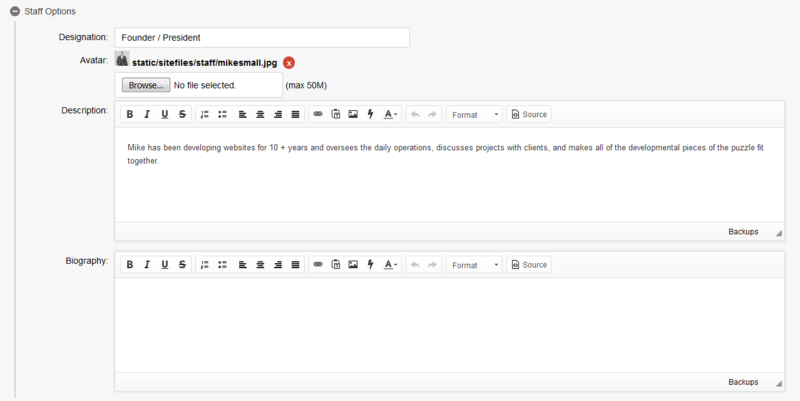 Select the email setting you prefer to use to send emails from the website (using normal mail option, SMTP, or Mailgun). This applies to all emails sent out through the website, except Newsletters if they are set to use a separate method. This functionality enables to suspend the site, effectively taking it down temporarily, as well as display a global message across the site. Site Maintenance: You can suspend the website completely, effectively taking it down, and/or suspend site logins and registrations (if applicable to your site), by checking the box of that which you want to suspend. Website Suspended Text: If you suspend the site, visitors will see a blank white page with whatever content is shown within the WYSIWYG editor. You can leave simple text, or you can insert images. Once you uncheck the suspension box, this the site will display. The Global Website Notification Text, is a simple way to display an urgent message. Examples of how this functionality as been applied include storm related message to staff and customers, meeting notices, sale announcements and reminders. The verbiage will display on every page of the site, typically below the site navigation. When you no longer need the message displayed you simply delete the text and update the settings. To enable Frontend Editing the Frontend Admin box must be checked. This will enable you to edit pages while you are viewing the front of the site. You must login to the admin and click View Website from the top of the admin to open the site in a new window where you'll be able to begin navigating and editing the site from the front. Admin Logo: This is where you upload the logo you want to display in the upper left of the admin. Admin Skin: Select from three pre-loaded admin skins. There are several functions within FICMS that send users and/or the administrator notifications via emails. Within the Email Templates section under Settings in the main menu, there are tools to control the static content within the emails, as well as the data (dynamic variables) that needs to be pulled in from the database that contains all of the information for the site. Certain email templates are part of the core of FICMS and cannot be deleted. To Edit existing templates, click on the Edit icon in the right side column. You will have access to the WYSWIYG editor where you have the option to toggle and access the HTML for direct editing. 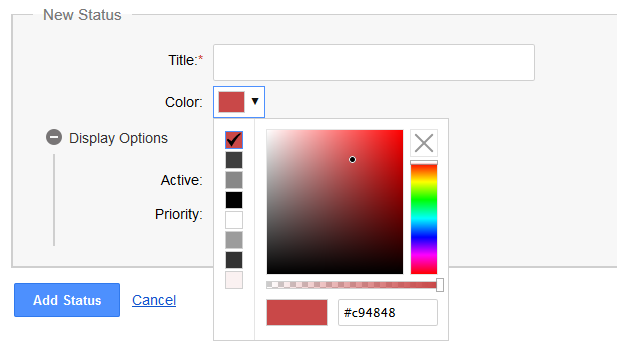 To Create a New template click on the red New Template button in the upper right corner of the admin. To Insert Dynamic Variables, click on the Insert Content Codes icon (4th from the left - top row) in the WYSIWYG editor to select from pre-populated options, or you can create your own. All email templates can be toggled between active and inactive. Note: Not all email clients support HTML emails. For example Microsoft Outlook has limitations, such as fixing image height the editor and styling of the text. When you are creating or editing a template you will notice a Title field. This field is strictly for your reference and only displays within the admin list of email templates. The Email Subject Line is where you enter the subject line for your email. 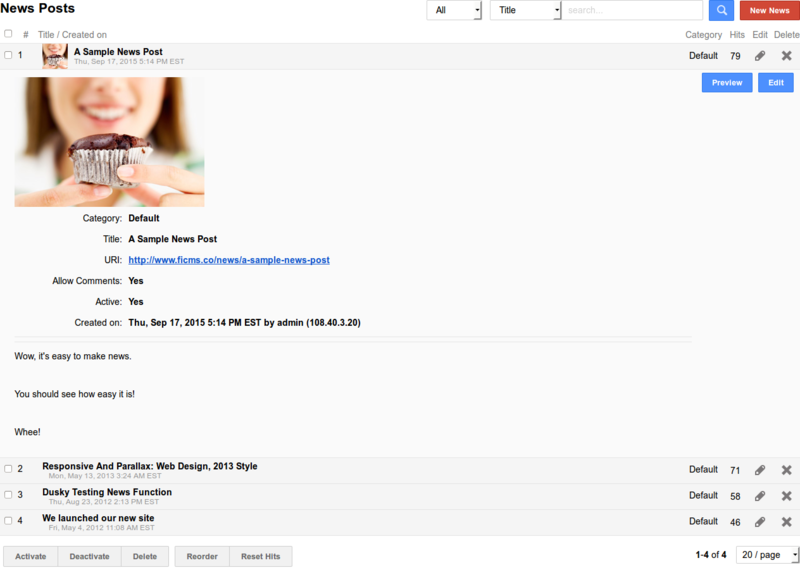 Use the WYSIWYG editor to modify the email content. Some content is obtained dynamically before being sent to the recipient. Those are programmed in the system by default for those email templates, if those are modified in the content and remove the dynamic values, the email will not be populated with the associated information. The FICMS Contact Module and Form Builder Module both allow users to submit information to you through the use of forms. These submissions are stored within the FICMS database for your on going reference or export. Each of these submissions, depending on the type of forms you have or how you utilize them within your company, can have a 'Status' assigned to it. Examples of a form submission status can range from Viewed or Contacted to Follow-up or Closed. These status are pre-populated in the drop down selector that appears at the bottom of the submissions list. To help easily identify submission status', each status can have its own color assigned to it. This color is displayed as a thin vertical bar to the left of the submission record. You have the ability to edit those that are already there or create new ones. To create new Status, click on the red New Status button in the upper right corner of the admin.To edit a record, click on the edit icon in the right side column. You will find the Manage Statuses option within the Settings tab of the Main Menu. Adding and/editing a status is simple once you've opened a new one or opted to edit an existing one. Enter a Title into the Title field. This is the Status as it will display in the drop down selector. Select a Color to assign to the status. This is what will display to the left of submissions the status is assigned to. Under Display Options check the Active box in order to make the status a usable option. You can select the Priority in the sort order that the status displays in teh drop down selector by entering the desired number in the field. Click the blue Add or Save Status button to save your edits. An installation of FICMS can contain multiple website templates, allowing you to change the look of your site on-the-fly. Website templates are manually uploaded via FTP within the /Templates folder. Once uploaded, the theme will become a visible option to choose from within the Website Templates section of the Settings menu. To activate a template, simple click the blue Activate button. Note: Your site comes pre-loaded with two templates: “Empty” (a basic template) and “YOUR WEBSITE NAME” (the one we have created for you). If you are capable of making modifications on your own, please do not do so until the development team has finished your development. The FICMS Mobile Website module is for use with those site design templates that are NOT made to be responsive in nature. If an FICMS site is not responsive, you can create a mobile friendly version by activating this module. By doing so you'll have the ability to control the design and formatting of this basic mobile version of the desktop website. To enable click the Yes option next to Use Mobile Website. To deactivate it, click No. and save. Upload the logo you want to use on the mobile version. Select the content page you want to use as the Home Page for your mobile site. Select the Slider category you want to use on the home page of your mobile site. This would require smaller images than the desktop slider. Select the navigation you want to use for your mobile site navigation. You can have multiple navigation groups, and can have one specifically set for your mobile site users. There are three areas of navigation available within mobile site (Main, Panel and Footer). 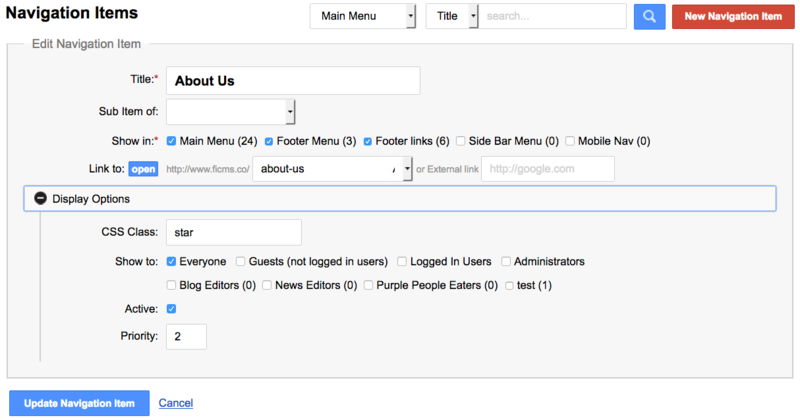 The Footer Content WYSIWYG editor allows you control over what content is shown in the footer of your mobile site. Be sure to click the blue Update Settings button to save your work. FICMS can be used to power native applications. Through this module you can control. Windows *+ icon and tile Color. The FICMS Mobile Module has theme controls that enable you to customize the colors and effects used to make up the mobile version of the site. Custom Colors for navigation background and text, as well as hyperlinks. The FICMS Mobile Module provides complete flexibility on how you display your social media accounts. Select if you want to Show Social Bar by checking the box. Enter the text using the WYSIWYG editor that you want to appear in the Bar Header. To display your phone number, enter it into the Contact Phone field. This will create an auto-dial link users can click to directly call from their device. Enter your email address in the Contact Email to allow users to directly email you. For all social accounts, paste your account URL into the corresponding fields and those icons will show on the mobile site. Clear the ones you don't want to use. You can also specify which specific operating system you wish to display it on (iOS, Android, Windows). Within FICMS under setting tab you will find the Website Caching option. This module allows you to turn PHP Caching on or off. This function stores (caches) previously loaded pages and can help reduce load time. FICMS has robust User functionality that enables you to create unlimited user accounts and assign areas of accessibility. This not not only applies to site administrator, but to front end users as well. If you wish to have password protected information on your site that is only accessible to 'members' or 'subscribers', you can create non-admin users accounts. Then within the specific pages you assign whether or not they are only accessible to users. Its that simple. When creating site administrators you have the ability to assign permissions so you can restrict access to modules on a user by user basis. Within the list of users you can click on an individual record to see details such as, name, email and account type. You will find the this user functionality within the User Section under the Site main navigation tab. To Add a new user click on the red New User button at the top right of the admin window. To Edit an existing user, click the Edit Icon under edit column to the right of the screen. 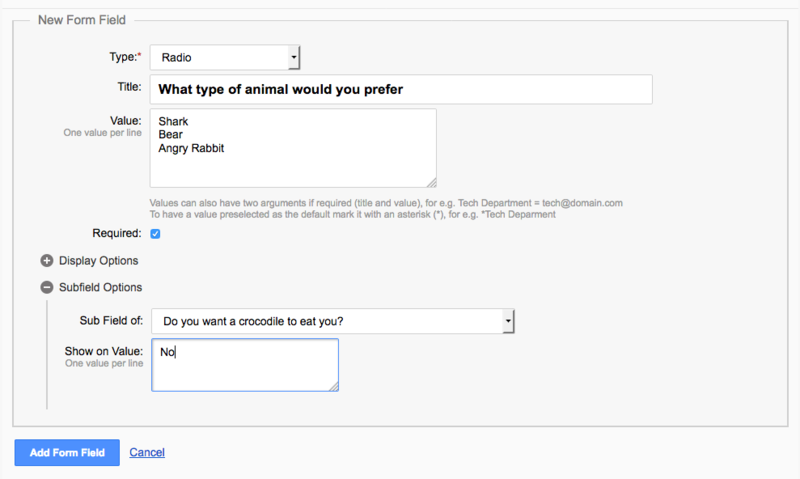 Select a Group you wish to assign the user to (if applicable). You will need to first create the groups before you can assign users to them. Instructions on creating groups can be found below. For admin group users, you can assign permissions to specific modules. Assign a User Name to the account. This will be entered along with a password to access protected areas of the site or admin. For admin accounts this will be used for logging user actions. Enter a Valid Email Address. This will be used to send forgot password emails.when logging in. Enter a Strong Password. The system will indicate the strength of the password as you enter it. Passwords are best when contain variations of lower case and capital letters, as well as numerals and special characters like punctuation marks. The Account Options area provides fields for specific user information. Since this can be used for site 'member' management, and not only site administrators, you can use this functionality to maintain your user accounts with detailed information. All of this information can be exported for use with Excel for use offline. Address, City, State, Zip and Country. The Social Options area provides fields to enter URLs for a users social media accounts like Facebook, Twitter, Google+, and website/blog. The Additional Options area is where you can control user accessibility to the site. This means allowing or restricting IP addresses, assigning users as Administrators or whether two factor authorization is disabled for a user. Restriction Policy allows you to choose to setup either a White-list (allow) or Black-list (deny) IP addresses for a user. You can only set up one or the other. This can be used to restrict access of users to specific locations. For example, if you are using FICMS to power your company intranet and only want the user to access the site while at your company locations. You'd create a white-list with your location IP addresses. Restriction Access to/from IPs, is the area you enter the IP addresses applied to the Policy you've chosen. The Administrator box must be checked if you are granting administrator access to an account. Public Account must be checked if the user is to have access to password restricted content of the public facing site. If you have Two Factor Authentication applied to your site (using a third party service like Twillo to send authentication codes), and you want to disable it on a per-user bases, you would check the Disable 2FA box. The Active box must be checked to activate the account so it is usable. The User Permissions area, located under the Users section of the Site main menu tab, allows you to permissions to administrators allowing them access to the various modules within FICMS. If you make a user an Administrators, by default they will have FULL access to all FICMS modules installed on the site. In order to restrict a user to specific modules, you will need to assign those specific modules manually to override the full access default. You can see what permissions and modules a user has access to by clicking on their name. To Edit the permissions of a user, click on the Edit Icon in the right side Edit column. To Add new permissions, click on the blue Select Modules link to open the window that shows a full list of available modules. Check the boxes for all of the specific modules you wish to assign permissions to then click the blue Grant Access to Selected Modules button at the bottom of the window. To Save your changed click the blue Update Permissions button. User Groups are an easy way to manage permissions if you have many site administrators. For example. 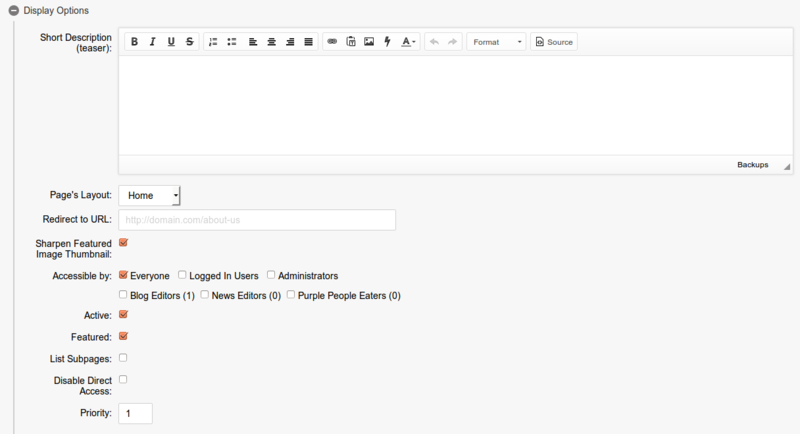 If you have many blog contributors, you can create a group named Bloggers, and assigned the blog module to the group. When you assign users that have administrator rights to the group Bloggers, they are automatically assigned permissions to that module. No further permissions action would be necessary for any of the users within that group, unless you needed to assign additional permissions to specific users that need additional access. You can see what modules a group has assigned to it by clicking on the group name. To see how many users are assigned to a group look at the User Icon on the right User column. There is a dark circle with a white number that indicates how many users it contains. To Edit a group, click the Edit Icon in the right Edit column. To Add a group, click the red New Group button at the upper right corner of the Admin area. In the Title field enter the name you want used for the group. 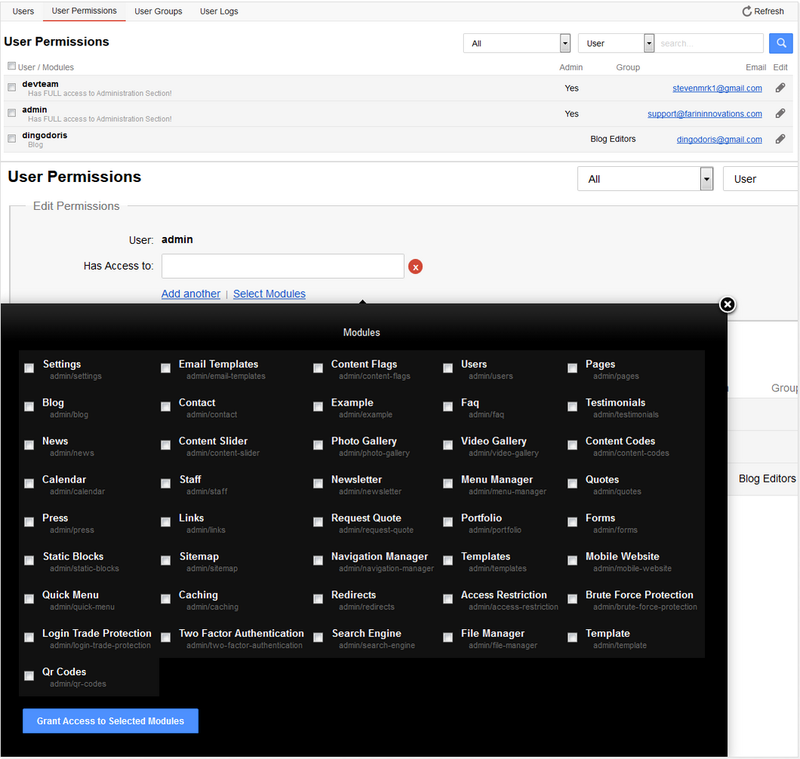 Click the Permissions Options item to expand it and reveal the Select Modules Link. Click that to display the available modules list. Check all modules that apply to the group and click the blue Grant Access to Selected Modules button. Under Display Options you select whether the Group is Active by checking the box. Mistakes happen, but don't have to be permanent. The FICMS User logs enable you to sort the actions of a user, see the changes that were applied and restore back to the original version prior to the mistake. The list within the User Logs shows you who did what and when. To filter by a specific user, enter the User Name in the search field and click the blue Magnifying Glass button. If you know date or date range when the mistake occurred you can include that in your filter. Once your results are displayed, look at the Action column to the right and find the action labeled Edit. Clicking the 'Eye' icon next to it will reveal the changes that were applied. Once you've located the action record you need to 'undo', and have expanded it to reveal the details, you will see the HTML of the content. This will include formatting as well as HTML tags. To see it as regular text, click the gray SHOW HTML button to toggle the view. In the HTML view you will see deleted content highlighted in Red. Content that has been inserted will appear in Green. If you did both, deleted and added, you'll see both colors and content. If you only deleted, then you'll only see red content (that no longer is showing on the front), and if you only added, then the new content will appear in green. To Revert Back to display what was there originally (put back deleted content and/or remove new content), click the blue Restore bottob on the right side of the record. You will be taken to the record for that specific page in the Pages module, where you will see the edited content prior to when your error was made. You must click the blue Update Page to save the revision and complete the action of reverting back to the previous version. The FICMS Testimonials Module provides an easy way to easily organize, maintain and display testimonials about your products and services. There is no need to worry about formatting, as the design template already controls that through CSS, ensuring the layout, look and feel are always consistent and perfect. The module is located under the Site tab in the main menu and displays a list of all testimonial records in the system. You can click on an individual record to see the details. To Add a new Testimonial, click the the red New Testimonial button in the upper right side of the admin. To Edit a Testimonial, click on the Edit Icon for the record within the Edit column on the right side of the admin. To Delete a Testimonial click on the Delete Icon (X) in the Delete column on the right side of the admin. In the Name field, enter the name of the person providing the testimonial. In the Description text area, enter the full testimonial using the WYSIWYG editor and format as needed. You can Upload an Avatar Image (image of the person), by clicking Browse and selecting an image from your local drive. The Designation field can be used for the person's Position or Title, or any other descriptor you wish to include. The Website URL field allows you to include a link to an external site, such as to the persons business website, blog or social media pages. The Created On field enables you to select the date the record was created on, in the event you wish to display this information on the fronted of the site. The Active box must be changed for the record to be live on the site. The number within the Priority field determines the placement of the record among all other available records. Enter the number of the position you want the record to be placed and save to apply. FICMS Content Codes are predefined code snippets that can be inserted into any area of the site (pages, static blocks, etc.). These codes can be used to insert a form into a page, insert a calendar category into a specific page, insert a photo gallery, or even insert expandable and collapsible content areas. The list of available codes grows as the site content grows. For instance as you add galleries, or categories to modules or forms, the list of available items to insert will dynamically increase. To Add a code click the red New Code button at the upper right side of the admin. To Edit a code click the Edit Icon in the right side Edit column. You can see and Sort the Content Codes by either Definition or Code by clicking the Type column header. To Delete a code click the Delete Icon in the right side Delete column. Within the record select the Type of content code. Enter the 'code' you need to use in the Code field. Enter any associated Values in the Value text area. There are notes to help assign below the Values text area. The Active box must be checked for the code to be available within the Content Code list. To apply a Content Code simply open the editor for the area you need to insert the element and put the cursor on the line you want to place it. Then click on the Content Code Icon (fourth icon from the left on the top row of icons). This will open a lightbox overlaying the editor that contains all of the codes. Scroll through to find the code you need and click on it. You will see it populate the empty field at the bottom of the lightbox. Click the blue OK button to insert the code into the editor. For most you will not need to do anything else. You can add content both in front of and after the code. Whatever is being pulled in will display between that content. This popular code requires a little bit of editing. The arg1 Is the 'Trigger' that will cause the content to expand to show the rest of the information. This is where you would put 'READ MORE' for instance. Clicking READ MORE will expand to reveal the rest of the content. You can also use images in place of text to act as the trigger. 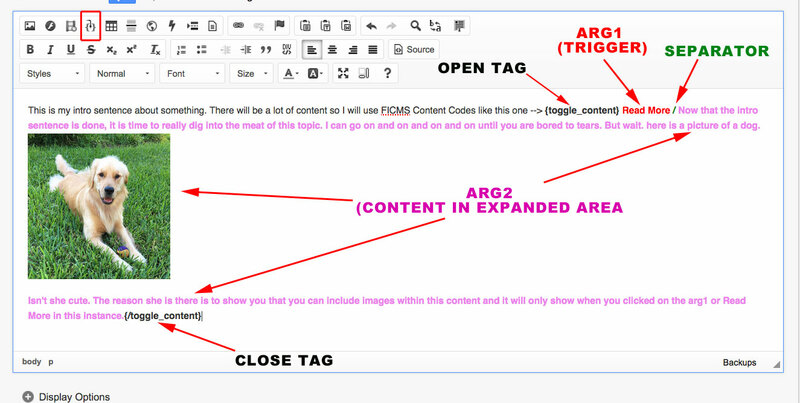 The / separates the "Trigger" from the content to be displayed within the content code. The arg2 is where you place the content that you want to be exposed when the area expands. This can be a few words or entire paragraphs, images, galleries, you name it. Note: The colors are used just to help you identify them here in the How To's. The code appears as plain black text when inserted into the editor. The FICMS Quotes Module is an easy tool that enables you to quickly and easily enter and manages a list of quotations or important ideas. How they display will depend on the template and/or theme you are using. Some will display as a list, some will display as a grid. For those that find inspiration in quotes and like to share them on their site, this module is perfect for you. The Quotes Module is located under the Site tab of the main menu. Once opened, the module will display a list of all quotes that have been previously entered into the system. It displays the name of the person the quote is attributed to and the time and date it was created. You can click on the record to see content of the quote. To Add a quote, click the red New Quote button in the upper right of the admin. To Edit a quote, click the Edit Icon in the right side Edit column. To Delete a quote, click the Delete Icon in the right side Delete column. Once a new record is created or an existing one if opened, the process is simple. In the Name Field, enter the Name of the person the quote or idea is attributed to. In the Description WYSIWYG editor, enter the Quote or idea. The Active box must be checked for the quote to appear on the site. Set the Priority or position you want the quote to appear among the other quotes in the system. Enter the number in the field. The FICMS Links Module is an easy way to manage lengthy lists of links to websites or online documents. By default the module displays both a title and the URL. The URL is the clickable link, however with a little bit of FICMS developer magic, the title can be made the clickable link and the actual URL hidden from display. You will find the Links Module under the Site section within the main menu. Within the module you will find Links (a list of all links in the module) as the initial view and Link Categories, which can be used to creating groupings of links. To Add a Link, click the red New Link button in the upon right section of the admin. To Edit a Link, click the Edit Icon within the right side Edit column. To Delete a Link, click the Delete icon within the right side Delete Column. To create or edit Link Categories, click the Link Categories menu item below the upper left logo. Upon selecting to create a new link record or to edit an existing record you will need to fill in the requested fields. Select a Category from the drop down selector. Enter a Title for the link. This will display to the left of the URL on the frontend. 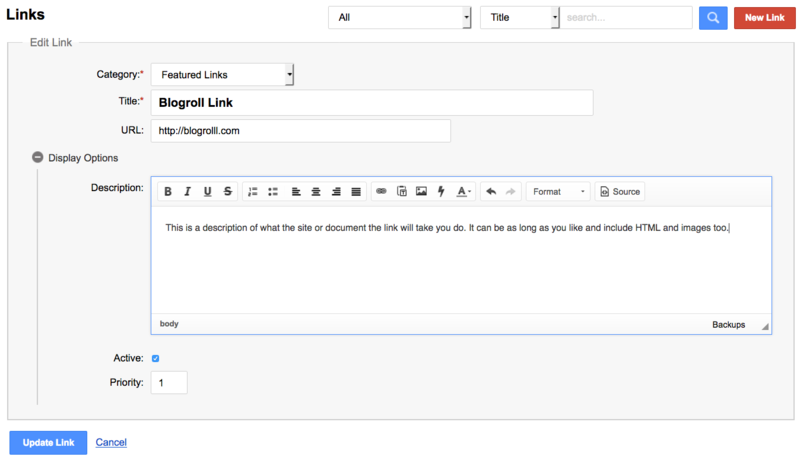 The Description WYSIWYG editor allows you to enter a complete description of the site or files the URL links to. This can include full HTML formatting, images, etc. The Active box must be checked for the Link to appear on the site. Set the Priority or position you want the Link to appear among the other Links in the system. Enter the number in the field. 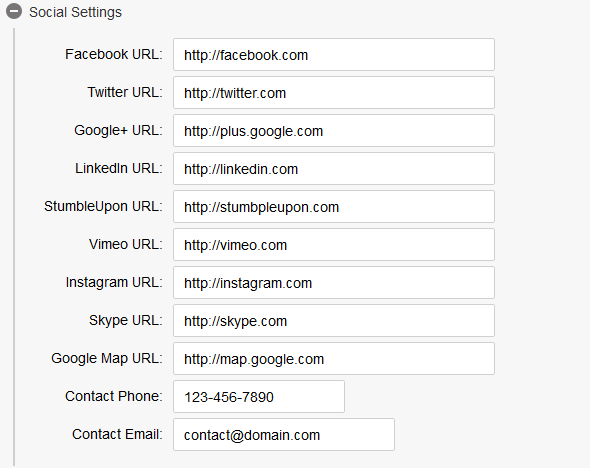 If you have links that need to be segmented, use the Links Categories function to create them. To Add a new category, click the red New Category button in the upper right of the admin. To Edit an existing category, click the Edit Icon in the right side Edit column. To Delete a category, click the Delete Icon in the right side Delete column. The Featured column indicates if the category has been flagged as featured. If so, and the module us integrated into the homepage, the links within the Featured categories will display on the homepage. Upon selecting to Add a new category or Edit and existing Category, you will need to enter the requested information. The Title field contains what you want to display as the Category title. The Category URL is the direct URL to the specific page that is created for that Link Category. Clicking the blue Open button to the left of the URL will open the page in a new tab. The Description WYSIWYG editor provides a way for you to enter a full description of what is contained within a specific category. This can have full formatting, include custom HTML and images. The Active box must be checked or the Category to be available for selection and be visible on the website. The Featured box must be checked if you want the Category and of the the links it contains to appear on the homepage (if the module is integrated into it). The SEO Options section allows you to add or edit the Meta Title, Meta Keywords, Meta Description, and Canonical URL of the specific cateogry entry. FICMS contains Static Block functionality that enables you to have editable content that is not part of specific pages or modules inserted within your design theme or templates. These static blocks are inserted by your FICMS developer. 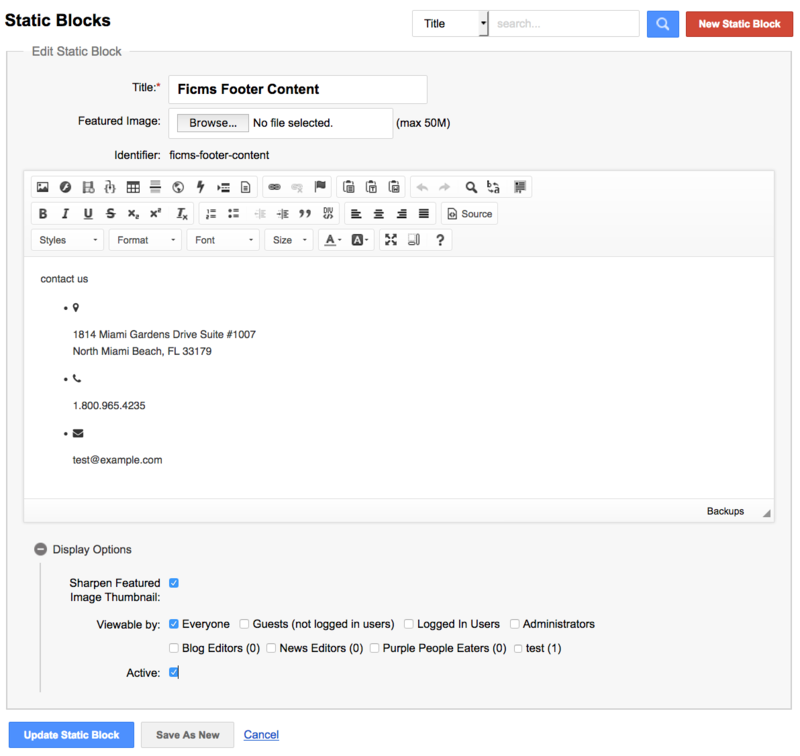 The Static Block Module provides the tools for you to create new blocks and edit their content. You'll find the module under the Site main menu within the admin. The initial view within the module shows the list of existing static blocks in the system. You can click on a record to display the details and un-formatted content it contains. 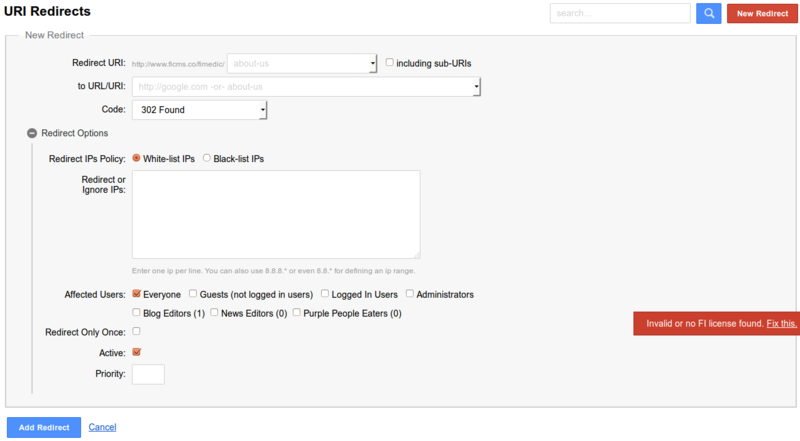 To Add a Static Block click the red New Static Block button in the upper right area of the admin. To Edit a Static Block click the Edit Icon in the right side Edit column. To Delete a Static Block, click the Delete Icon in the right side Delete column. Upon selecting to create a new Static Blick or to edit an existing record you will need to fill in the requested fields. The Featured Image upload function is used if a Static Block contains a standardized image that is always within a specific spot within the template. The Identifier is what the system uses within the code. 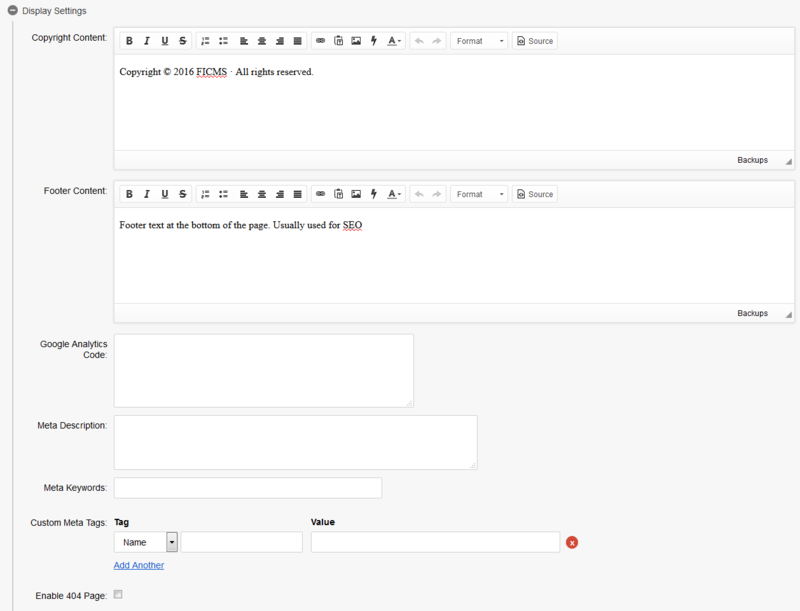 The WYSIWYG editor is where you enter and edit all of the content that appears within the static block on the frontend. Sharpen Featured Image Thumbnail will sharpen the thumbnail if one is used. the Viewable By allows you to assign access by user types should you wish to restrict its visibility and access to those with site 'user accounts. The Active box must be checked in order for the static block to be usable within the site template or theme. The FICMS Admin contains a dynamic Site Map module. 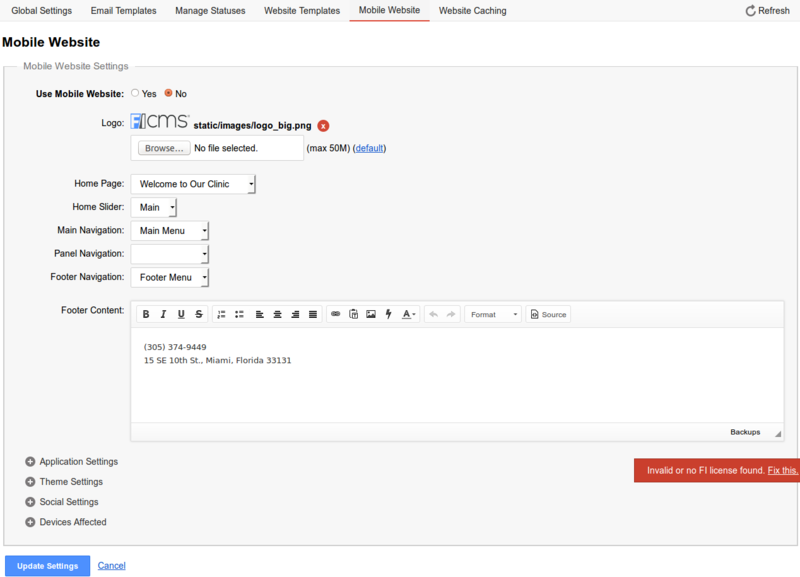 This module automatically generates a Sitemap that displays on the frontend, as well as an XML file that can be accessed by Google Webmaster Tools. You can access the module through the Site main menu tab. Through the module you can manually add or remove pages from the site map. Through the area of the Sitemap Module, you can make manually changes to the XML file, as well as Regenerate the site map. 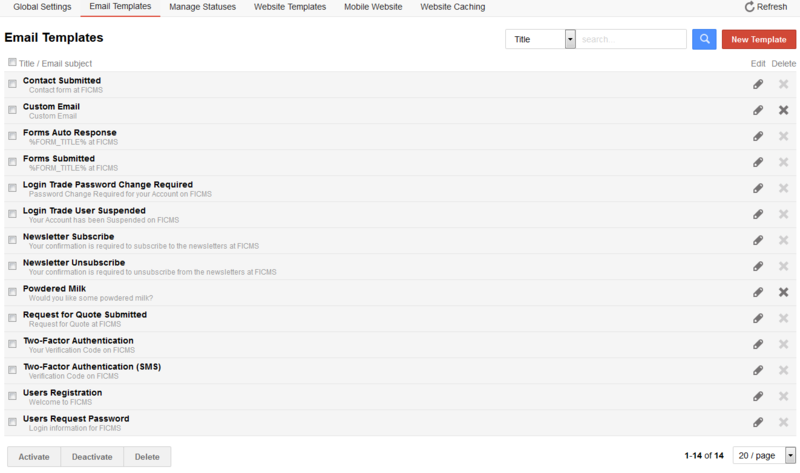 The FICMS Navigation Module gives you the ability to customize the navigation elements within a site. First there are Navigation Groups, which essentially are the various navigation menus within the template or theme. These can include the main site navigation, side bar navigation, footer navigation, mobile navigation, etc. You have the ability to create and maintain an unlimited number of Navigation Groups. Every Page from the Pages Module is assigned to a navigation group, unless it is 'free-standing' and only to be directly linked to from within the content by a text hyperlink. The Page Title, and the URL that is generated are used for the navigation (Menu label and link) by default. Through the Navigation Module, you are able to change how the page is labeled within the navigation as well as edit the URL. For instance if the page is About Us, but you want it to only show About in the navigation, using the Navigation module, you would delete the Us from that record and save. Within the navigation elements the item will read About, however the Page Title would still remain as it is in the Pages Module displaying as About Us. You will find the Navigation Module within the Site main menu within the Admin. The initial view will be the Navigation Groups. 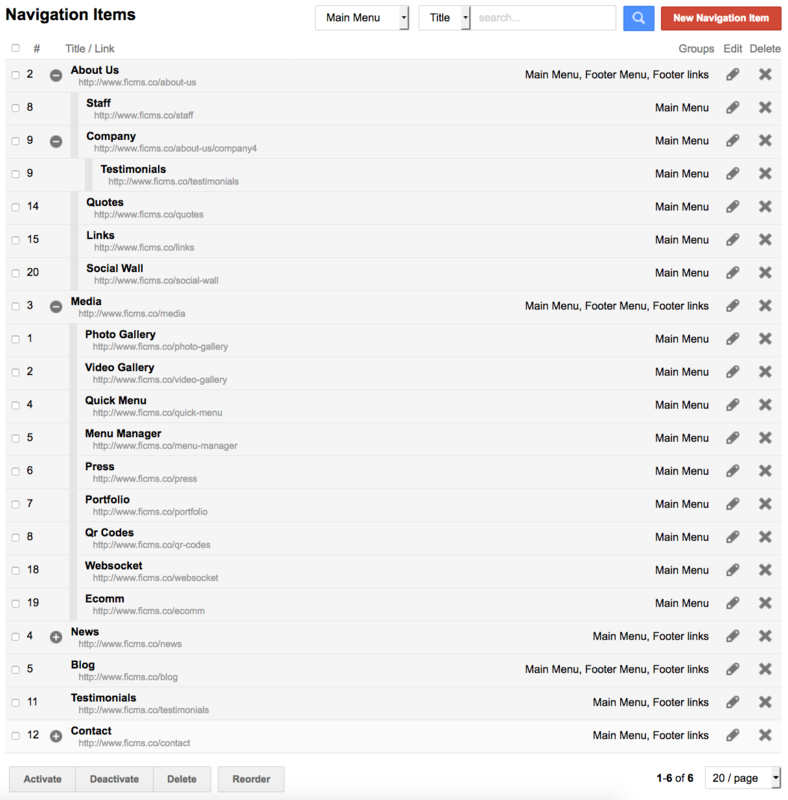 To access the list of Navigation Items (shown on left), click the Navigation Items menu item to switch screens. Navigation Groups amount to the various navigation menus you have within the site template or theme. You can create new groups or edit existing groups. These groups are coded into your site structure, but can also be inserted within pages, static blocks, or other modules that support content codes via a WYSIWYG editor. Then inserted using content codes, these groups display as a bulleted list by default. Your FICMS developer can customize how look with CSS formatting. To Add a Navigation Group, click on the red New Navgation Group button in the upper right corner of the admin. To Edit a Navigation Group, click on the Edit Icon within the right side Edit column of the admin. To Delete a Navigation Group, click on the Delete Icon within the right side column of the admin. To access the Items that are assigned to a Navigation Group, click on the dark circles with white numbers that display in the Items column of the admin. The number displayed shows how many items are within that group. Clicking on it will take you to the items list for that specific group. The Title field is how the Navigation Group will be displayed in the admin for your reference. The Identifier, chich can be edited by clicking on it, is automatically created based on what it typed within the Title field. This must be in all lowercase letters and numbers and have a hyphens in place of spaces. The Active box must be checked if the Navigation Group is to be usable. The Priority field sets where within the admin list the Navigation Group appears. You can Filter the list of menu items by Navigation Groups by using the drop down selector along the top showing "Main Menu". To Add a Navigation Item click the red New Navigation Item button at the upper right corner of the admin. To Edit a Navigation Item click the Edit Icon within the Edit column on the right side of the admin. To Delete a Navigation Item click the Delete Icon within the Delete column on the right side of the admin. To Reorder the sequence the pages display in the menus, click on the number to the left of the item. A text box will appear where you can change the number. You can do this in bulk by clicking all the items you wish to change and editing the numbers. Once done, click the Reorder button at the bottom of the screen. You can reorder the sequence of items within sub menus as well. Click on the title will display information related to the item including the title, menu(s) assigned to, visibility, URL, and active status. You have the option to Add new items to the navigation or edit existing records. Creating a New Navigation Item through this module does not create a new page. It simply adds a new item to the navigation group(s) you assigned the item to. This could be to create additional paths to content deeper in the site structure or to an external site of document. Selecting to edit an existing item allows you to do just that. Once you've opened a new record or are editing an existing item you will be presented with the following items you can control. The Title is what will appear in the navigation group. If you are editing an existing page, this will display the page title. You can change the title here so that it displays differently in the navigation than as the title does on the page itself. the Sub Item Of drop down selector contains a list of all of the main and sub navigation items in the system. You can assign an item to be a sub-item of other simply by selecting the item from the drop down that you want the item you are working on to be under. If the item should be under About Us, then select About Us from the drop down. The Shown In line shows check boxes that correspond to all of the Navigation Groups that exist in the system. You must select at least on item. The Link To line provides the option to select an existing page within the system from the provided drop down selector, or to enter a full URL (including http://, https//, etc.) in the External Link text field. External URLs will open in a separate tab. To view a preview of the link click the blue Open button to just before the URL. The CSS Class field allows you to assign which CSS class you want assigned to an item (if applicable). The Show To field allows you to select who gets access to the item (Everyone, or limited to logged into users). The Active box must be changed for the navigation item to be visible in the navigation. The Priority field allows you to modify where within the navigation listing the item will fall. 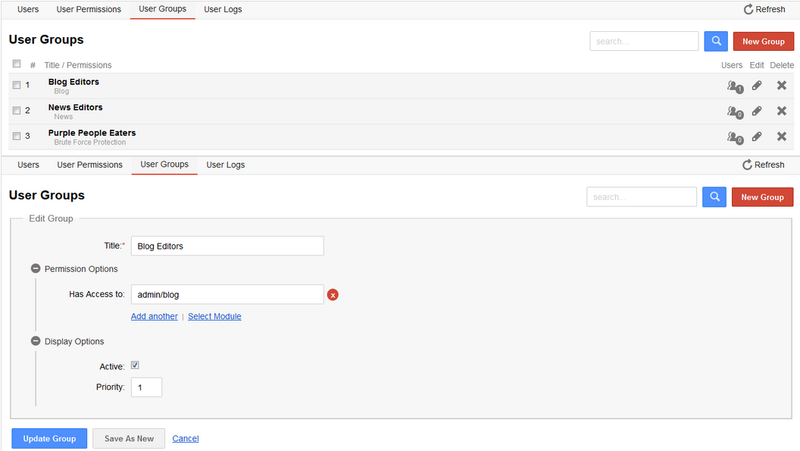 The FICMS Redirects Module enables you to easily apply URL redirect for the site and its content from within the admin. Access to this module is found within the Site Main Menu of the admin. Upon accessing the module you are presented with a list of any existing URL redirects that have been previously created. The list displays the URL being redirected in bold and the redirected link directly below it in smaller text. To the right side of the module are columns for Code, Edit and Delete. The Code column header, when clicked, will sort the list by Redirect Code assigned to the items. To Add a Redirection click the red New Redirect button in the upper right areas of the admin. To Edit an existing Redirect click the Edit Icon in the right side Edit column of the admin. To Delete an existing Redirect click the Delete Icon in the right side Delete column of the admin. Clicking on the line for a specific record expands it so display the details of that redirect record. The Redirect URL line displays the site's root domain beside Drop Down Selector that contains the pages within the Pages Module. This field is also a Text Field where you can directly enter the remaining path of a specific page. This would be used for specific blog or news posts, or other specific URLs that are within installed FICMS Modules. If you wish to redirect sub-page URLs within a main item (such as About Us), be sure to check the Including Sub-URLs box. The Code drop down selector contains a list of redirection types you can choose from (404, 301, etc.). The Redirect IPs Policy radio buttons enable you to creatte either a White-List (Allow Policy) or Black-List (Block Policy) for specific IP addresses to control if those IPs have access to the redirect or not. 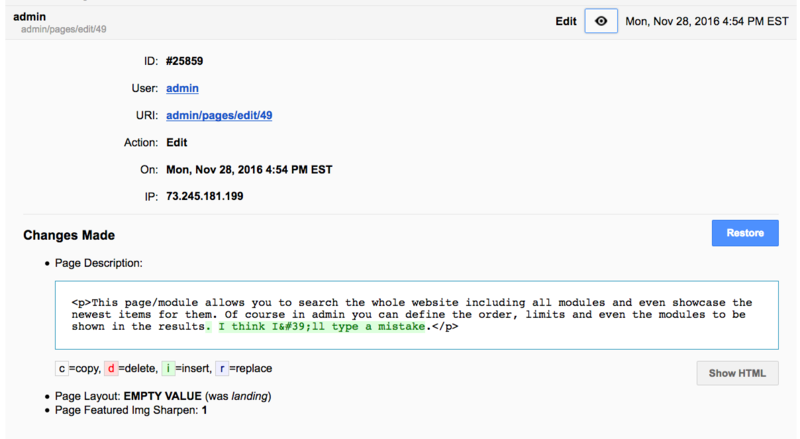 The Redirect or Ignore IPs text areas is where you enter the IP addresses to be included in the Policy you create. The Affected Users check boxes are associated with the User Groups that expect in the site and enables you to grant access to redirects based on user types and accounts. The Redirect Only Once box must be checked if you want the redirect to only be applied one time. The Active box must be checked if you want the Redirect to be applied. The Priority box is only used to affect where the specific item displays in the list of redirects . Note: Redirects should only be done by those with prior knowledge of URL redirection and that is familiar with the Codes and their meaning and affects. The FICMS Search Engine Module allows site users to perform keyword searches for specific site content within content pages and modules. The module's administrative functions can be accessed under the Site tab in the admin main menu. 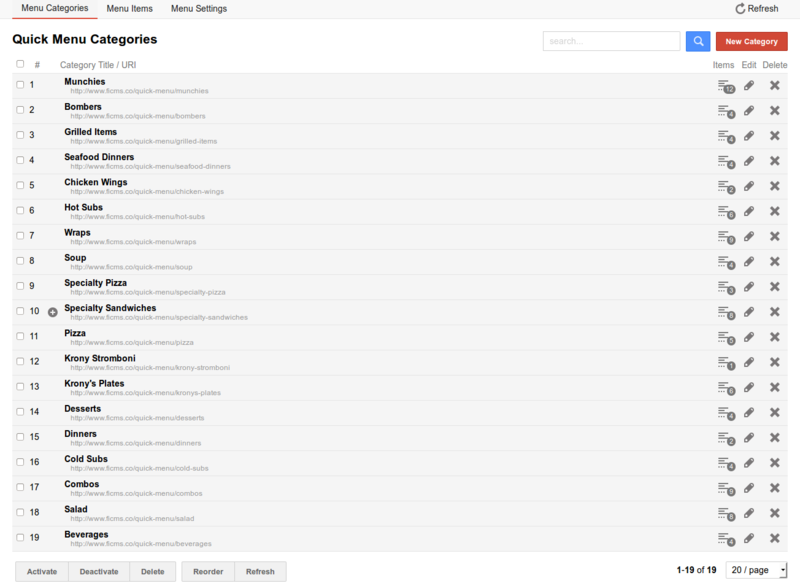 Within the Search Engine admin area, a full list of installed modules is displayed. You can click on any item to view details about its search configuration. The listings include a column for the number of showcases, if the showcases are set to display the newest items, as well as edit and delete options. Showcases are the records within a specific module that display in the results. 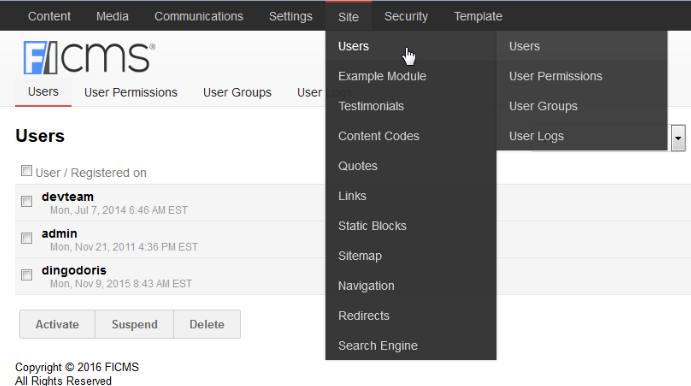 To Add a new module click the red New Search Module button in the upper right corner of the admin. To Edit an existing module record, click the Edit Icon within the Edit column on the right side of the admin. To Delete an existing module record, click the Delete Icon within the Delete column on the right side of the admin. The Module Name drop down selector provides a list of all installed modules within your instance of FICMS. Select the module if adding a new one to the Search Module. The Showcase Limit text field is to control the number of records that are shown on the actual Search Module content page without a search criteria. This is a specific page you can navigate to, and not the actual results page of a search query. The Pagination Limit text field controls the results that are displayed within a specific modules Search Module page. For instance, you visit the Search page (not via a query), and you click on the button to visit the Search Page specific to the Portfolio Module, The Pagination Limit will set how many records will display on a page. In the image to the right, it is set to five. After file the Pagination will display where you can click through to the next page and see more results. The Showcase Newest box, must be checked if you want the results to pull the most recent items added to the module. 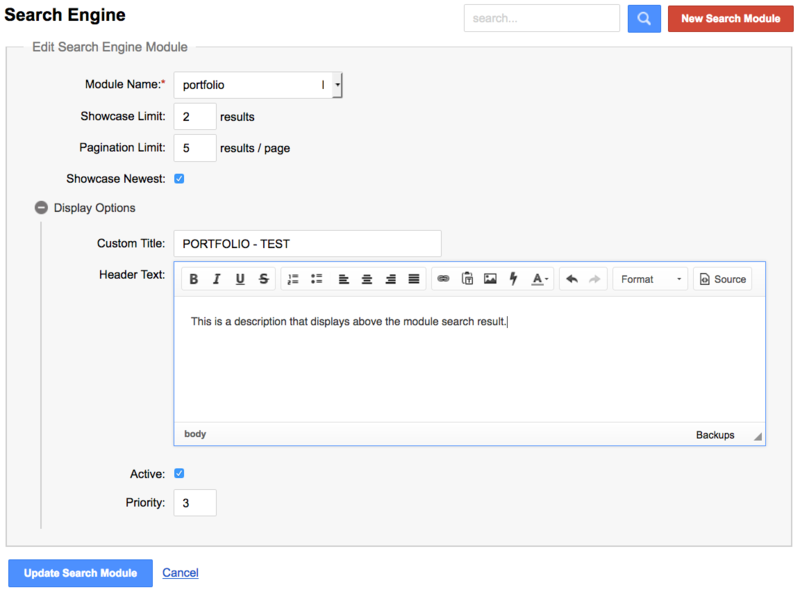 The Custom Title field allows you to modify now the Module Names display within the Search Module page listings. The Header Text WYSIWYG allows you to enter a description for the module results that displays below the Custom Title and above the Showcases for that module. The Active box must be checked if a module is to be available within the Search Module results. The Priority box allows you to set the position of a module within the overall listing of modules.